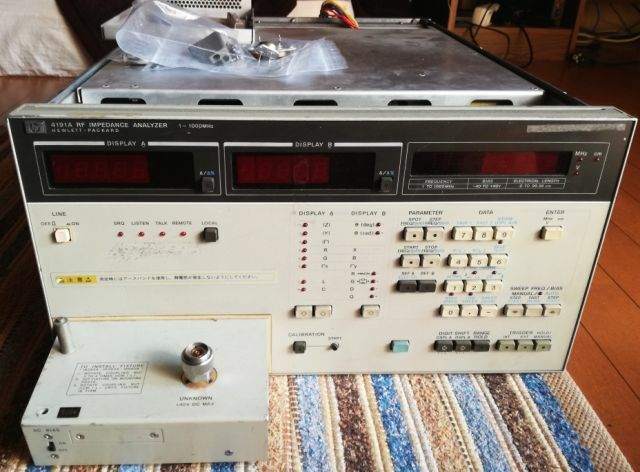 This is a Takeda TR6142 (also known as Advantest R6142) programmable DC source, a great find at less than EUR 50, of course, in non working condition. 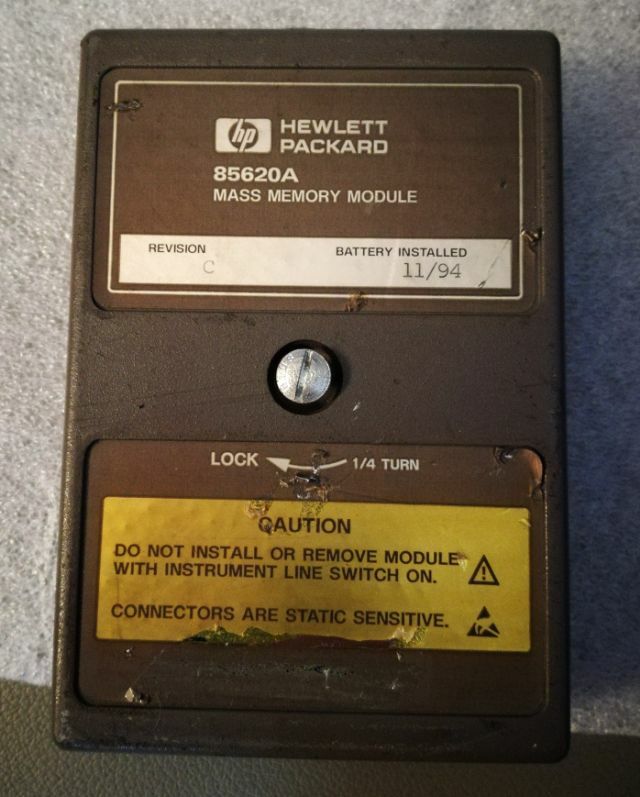 The item arrived in good shape, but unfortunately, as described – non working, display comes up but no reaction to any key press. It just won’t interact with the operator. 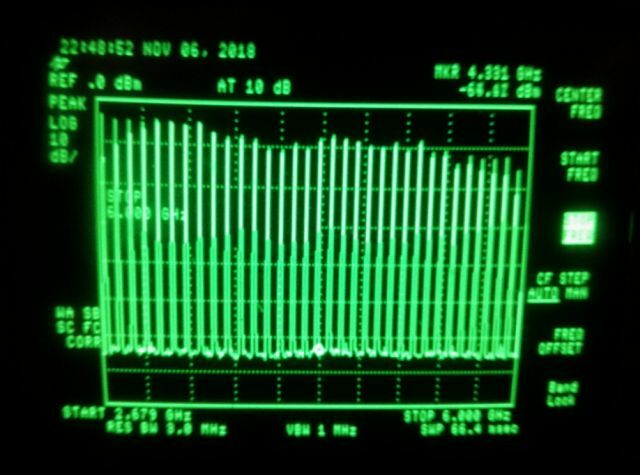 This 6142 is almost a cal standard type of source, 0.03% over 6 months (probably, for several years), 3 mV peak to peak noise, etc., it is also great to test semiconductors or to provide defined voltages and currents (up to 12 Volts, up to 120 mA), to devices under test, or circuits under development. 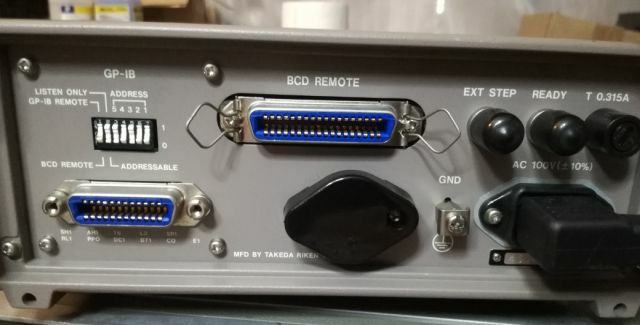 As an interface, there is a BCD input, and a IEEE-488 (GP-IB) input. 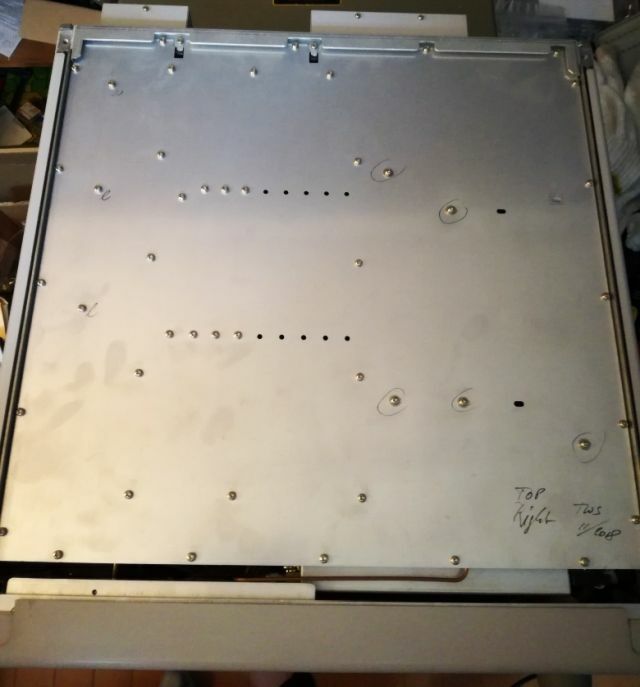 Looking inside, there is a logic board on the top side, and a shielded box with the analog circuits at the bottom. 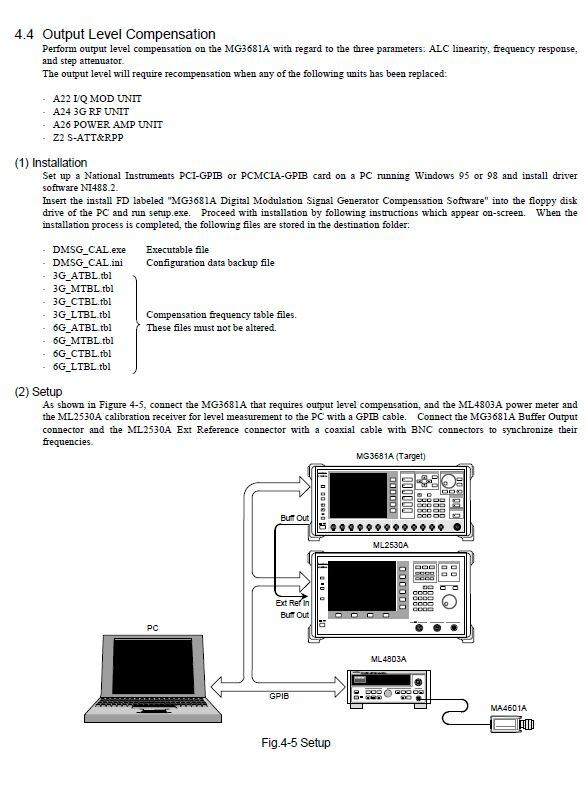 Fortunately, there is a manual with schematics available, let’s do some probing. Seems the CPU is waiting for something – it is not executing any commands, when I look at the data bus with a scope probe. What could it be? 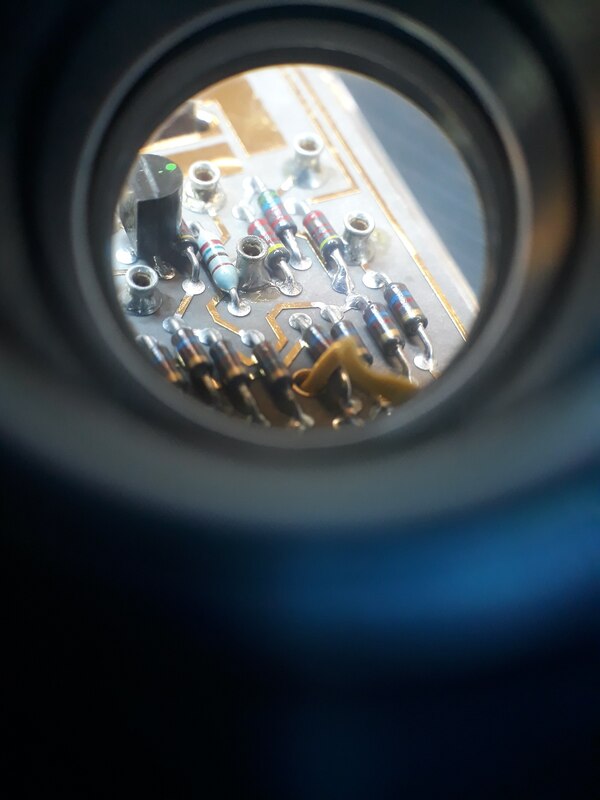 Checking all the inputs to the CPU – there are not many, mostly, the GP-IB, the BCD interface, and, the keyboard. The keyboard is a matrix design. Turns out, one key is stuck! These buttons are some kind of pressure sensitive switch – they don’t have a “click” or other clear action when you push them. It could be just dirt or age that gives low resistance. 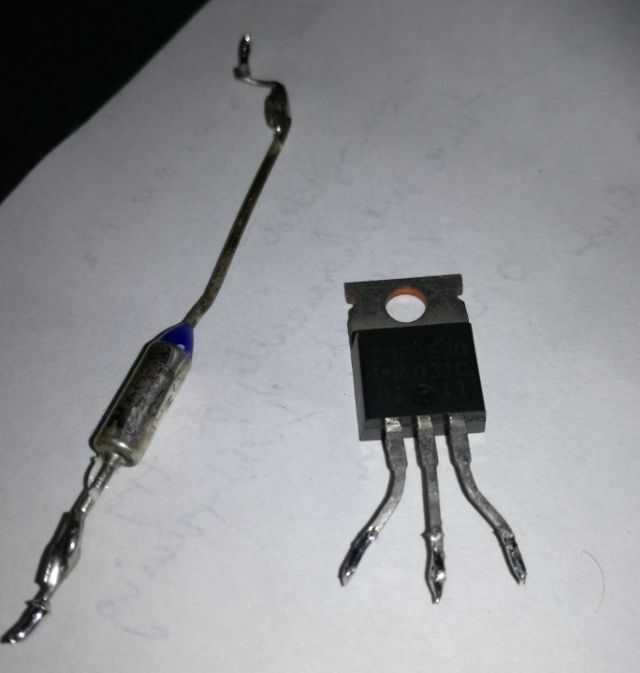 Unfortunately, these switches are difficult to disassemble, so I soaked the switch in some isopropanol. 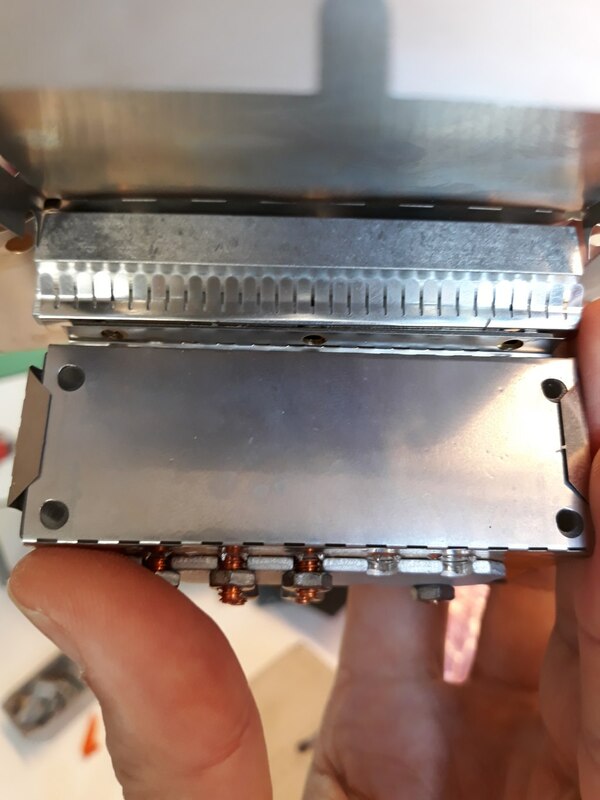 Another thing that helps is to resolder the keys really hot, this will melt away the dirt layer (which may be just some organic residue or moisture) inside of the switch, and also cure any solder joint issues with the keys, although I didn’t find any – but the pins are somewhat oxidized. That’s they keyboard assembly, cleaned and resoldered. After this fix – all is working fine, and the unit is responding to entries. 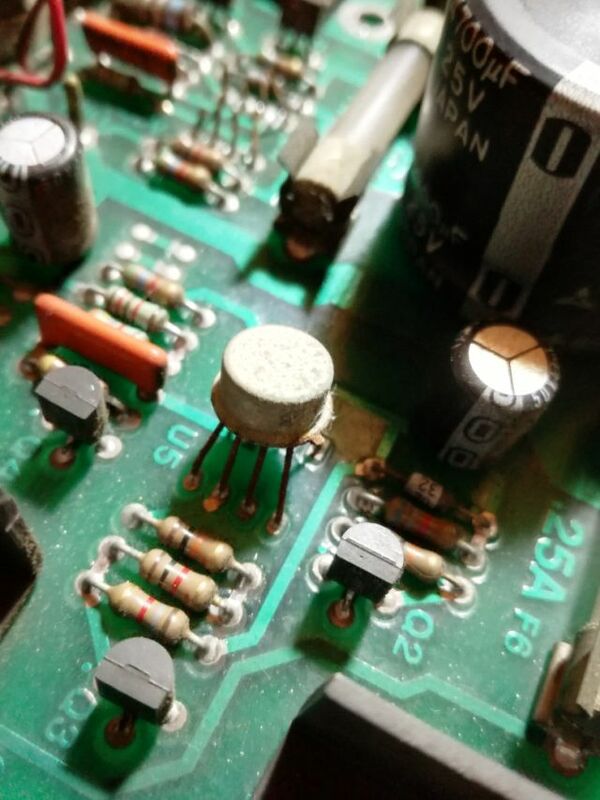 A quick look at the analog assembly (to check for dirt or other signs of aging) – no dirt found. 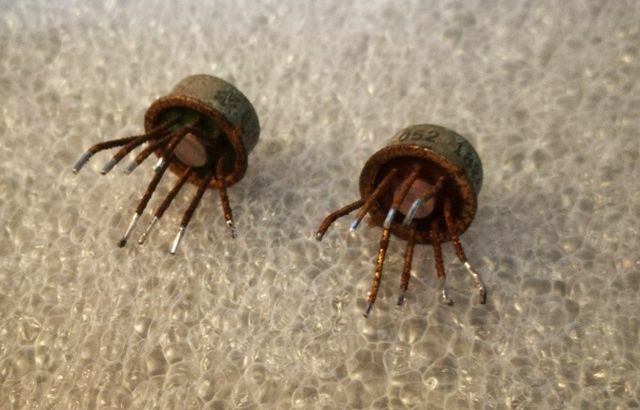 All is built with really high precision metal encapsulated resistors, teflon standoffs, and DC filtering. 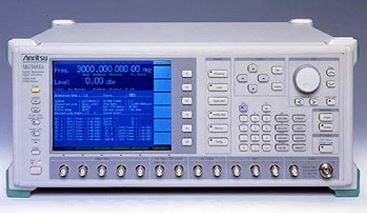 The main reference is a LM399, (0.5 ppm/K temperature coefficient, low noise, and, typically, 4 ppm drift per year). 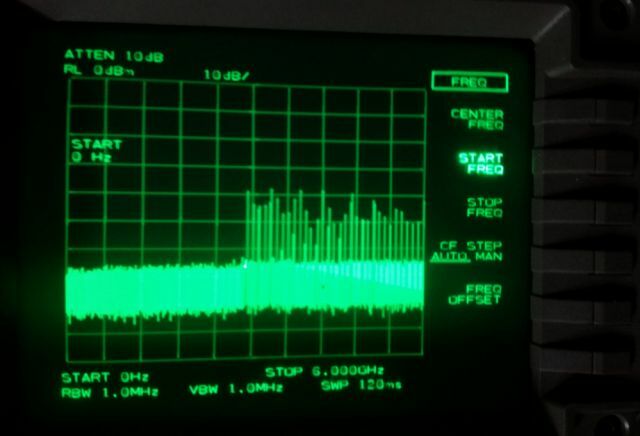 A quick test – with a simple instrument – it is working just fine (also tested the current mode). 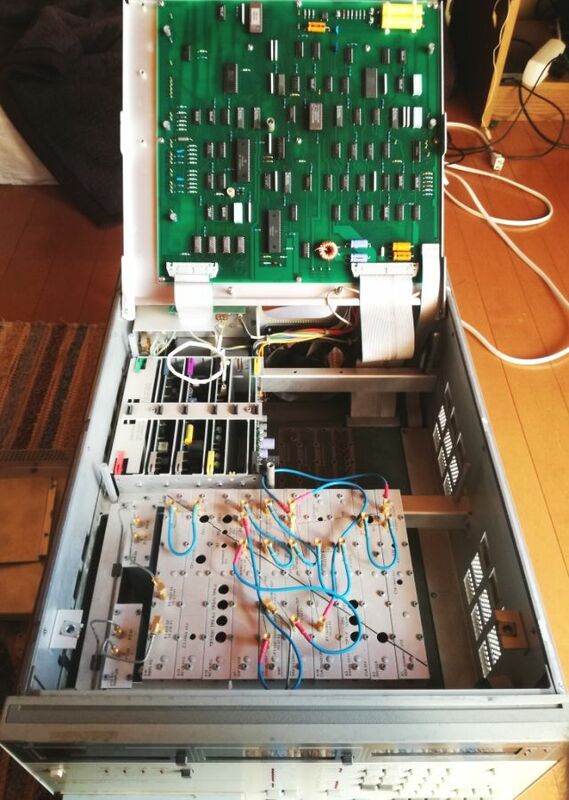 Now, another topic – I am currently working on this instrument in Japan, 100 VAC mains voltage, but later would like to operate it in Germany, 230 VAC. 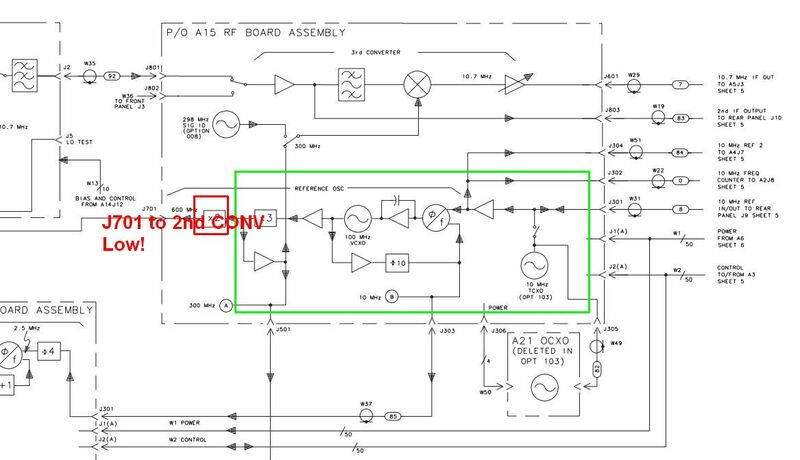 A quick look at the schematic – not good! 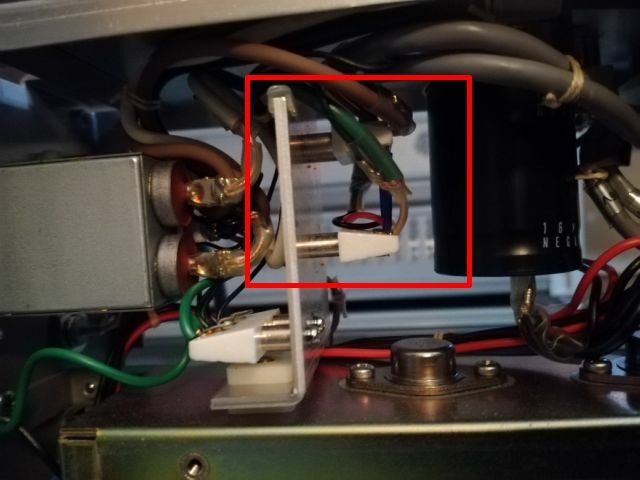 There seem to be 100 V and 200 V coils on the transformer, but no provisions for 230 VAC! That’s not good. 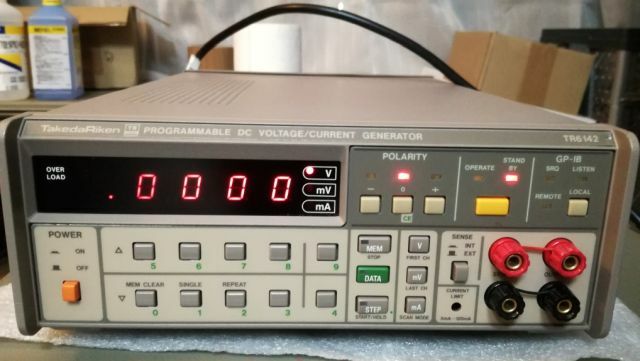 Let’s check the actual voltages and ratios – there is a solder terminal inside the unit. 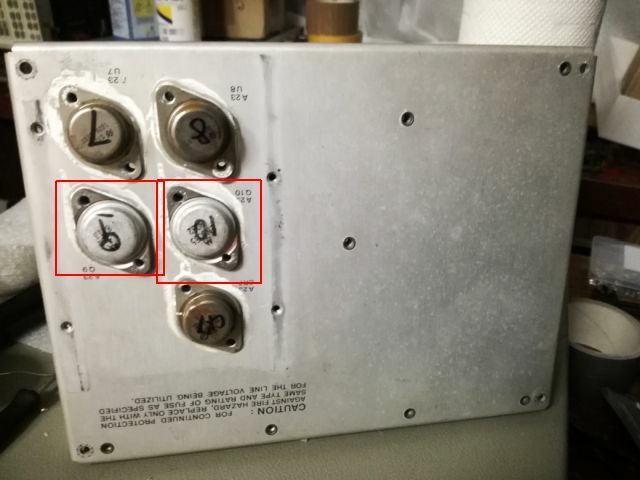 As it turns out, the schematic is either incorrect or outdated, the coils on the transformer are 0-100-120 VAC, and 0-100-120 VAC. So we can easily configure it for 220 or 240 VAC, yet, not for 230 VAC. 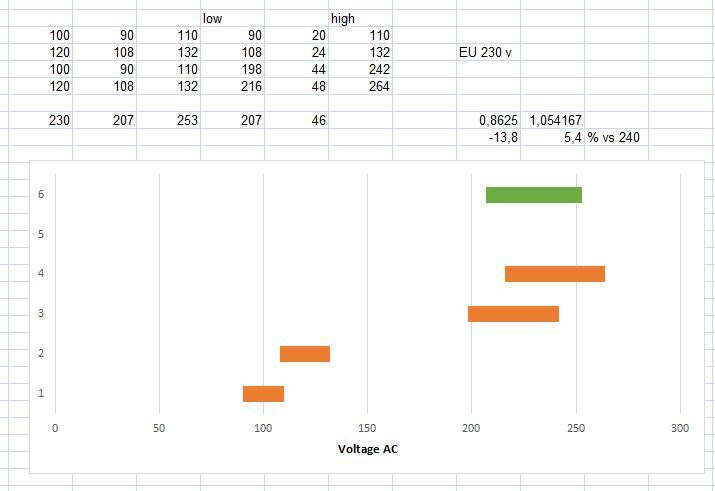 The 6142 is rated for a +-10% mains voltage tolerance, same as the tolerance limit in Europe, for the 230 V (although it rarely deviates from 230 Volts by more than 2 Volts at my place in Germany, in the middle of a city with lots of industries and arm-thick power cable going into the building). 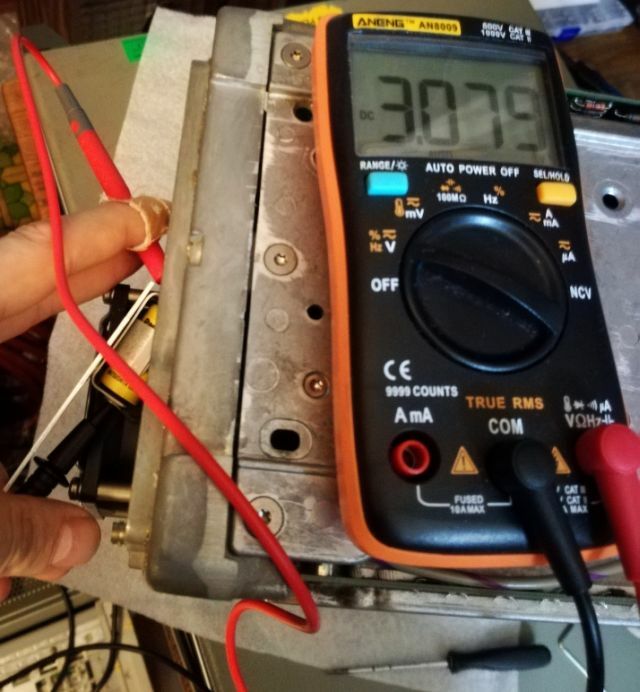 A calculation shows the ranges – it will definitely be better to configure it for 240 Volts, rather than 220 Volts, to avoid a dangerous over-voltage condition. But what are calculations, if you can do measurements (with the unit loaded). 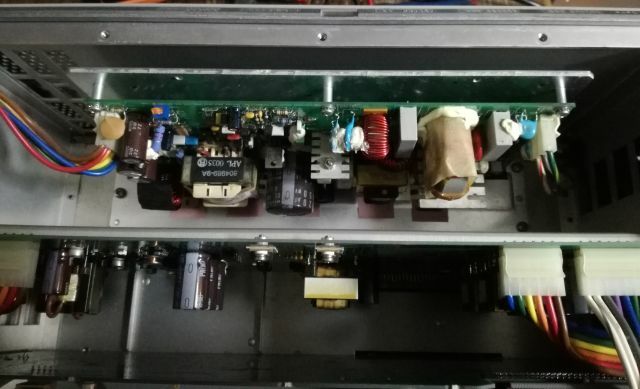 Seems there is good margin in the DC voltage design, and the voltages regulators are standard 78xx types, with maximum 2 Volts dropout voltage – and with the voltages measured, even in case of 230 VAC-10%, we will still have a working unit, and stable DC rails. 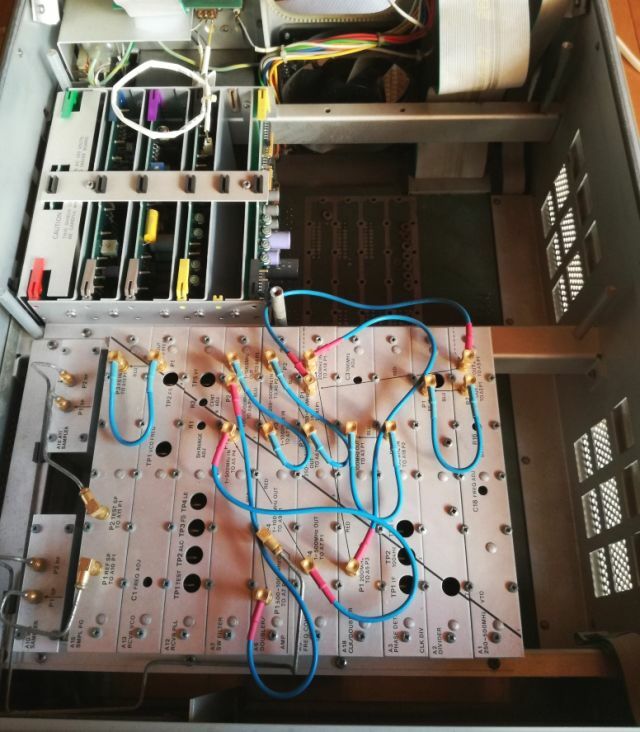 So, once back in Germany, we will just change the solder bridges in the voltage selector, and all will be ready for 230 VAC mains. 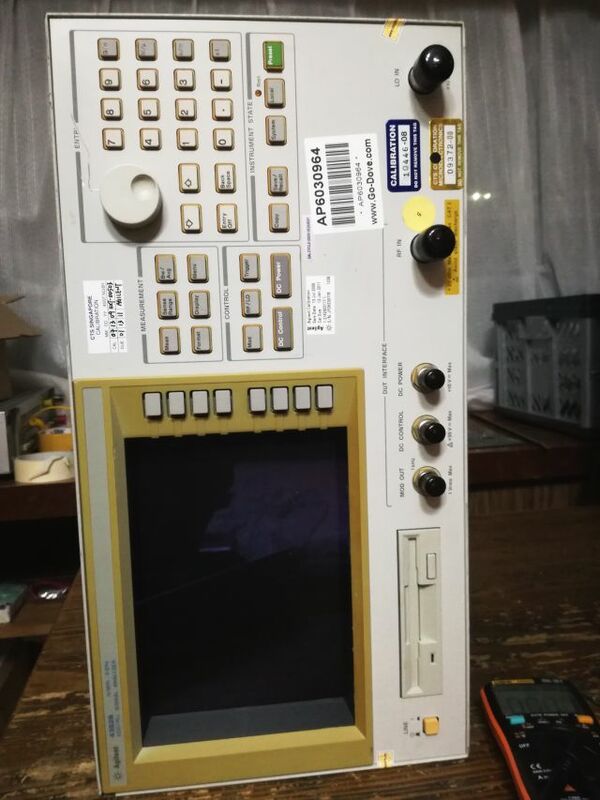 Along my search for used&broken&cheap test equipment in Japan I came across a Anritsu MG3681A 3 GHz generator, it has quite impressive specs, and the unit offered had the full CDMA-W digital package, allowing a whole lot of experiments with digital modulation. The price was right (just about EUR 100 plus shipping! ), so this was soon to become the the first Anritsu gear in my workshop. 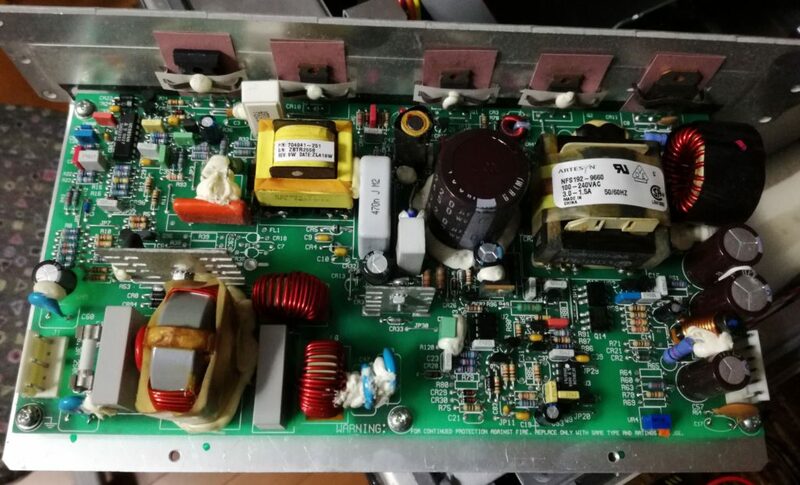 The information from the seller – at least it powers on, and frequency is locked. 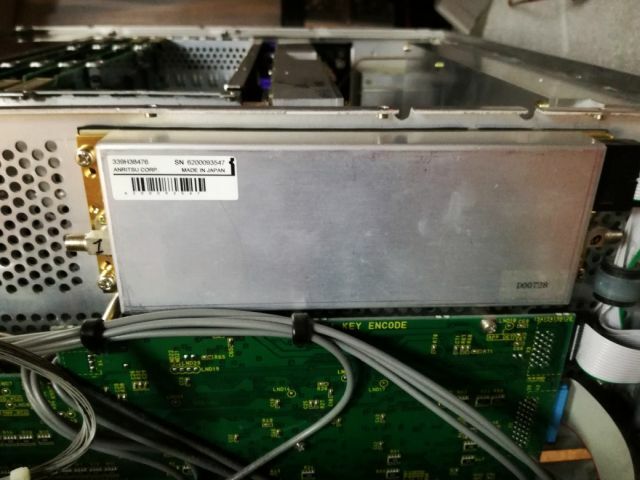 The unit also has the Option 02 OCXO, a really high quality 10 MHz source, so even if all the machine is defective and broken, there is still good use for it, just using the parts for other projects. Further tests confirmed that the output is low, albeit, it is locked and even the ALC (level control) appears to be working. Without having a good insight into the workings of this unit, also because of lacking schematics and details, I decided to do some tests. 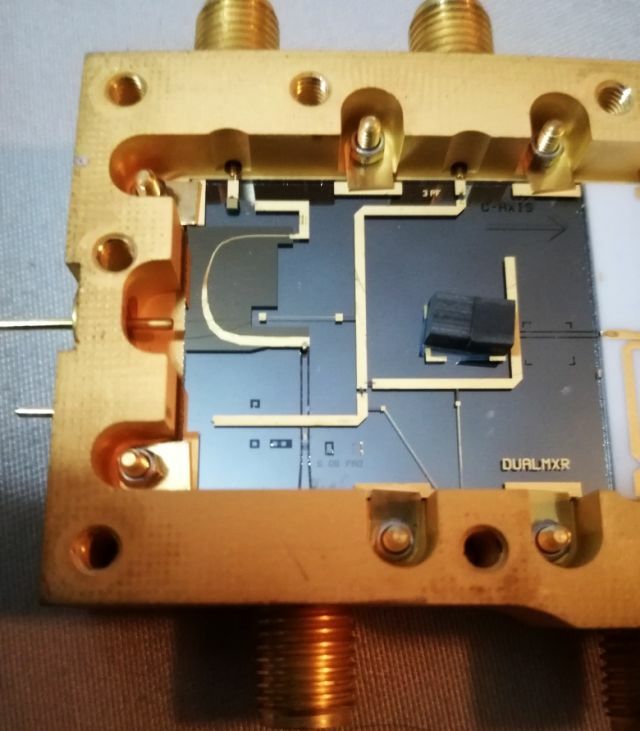 After removing about 100 screws or more (the unit has double and tripple shielding to avoid RF leakage), I got access to the attenuator and signals going to the attenuator (see block diagram). 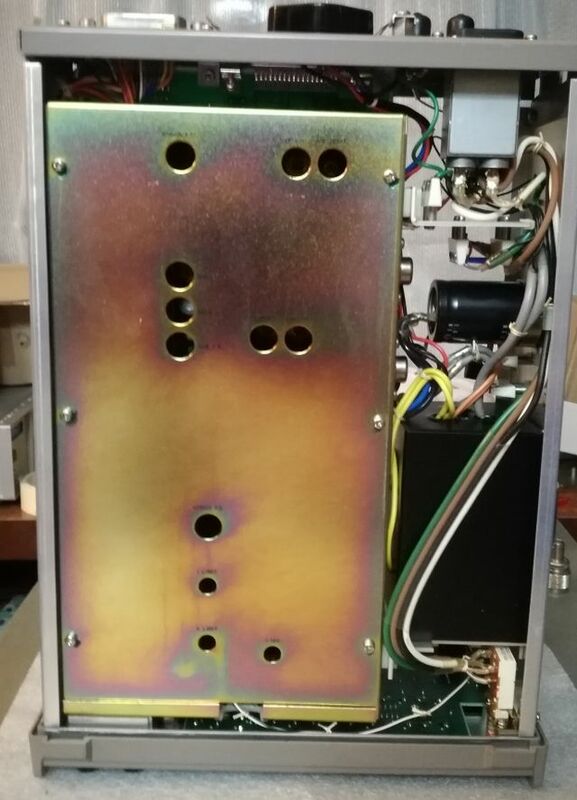 Obviously, something is wrong with either the attenuator (a burned segment or reverse power protection element introducing loss?) or the detector, or the ALC circuit itself. Checking the diagnostic messages – the MG3681A thinks all is good! 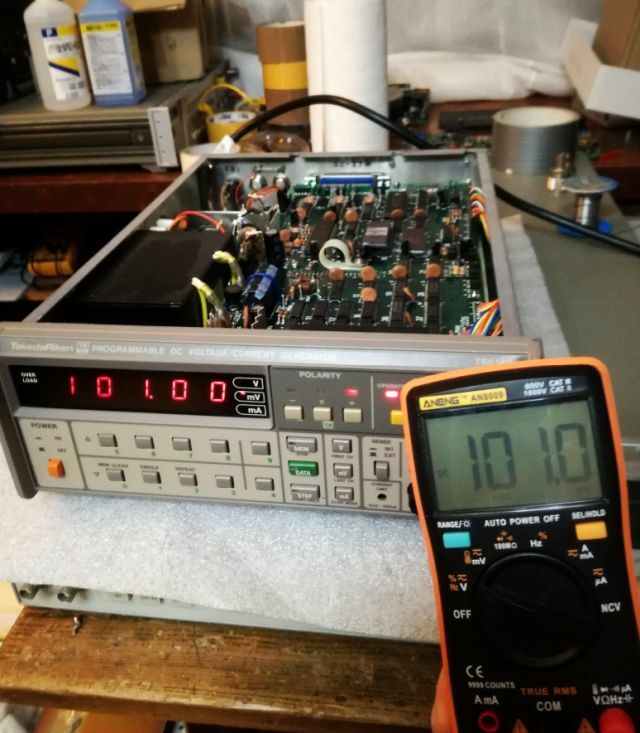 The only strange thing is that I don’t get any ALC error message (unleveled message, even when dialing in +17 dBm output, which corresponds to about 12 dBm output at present). 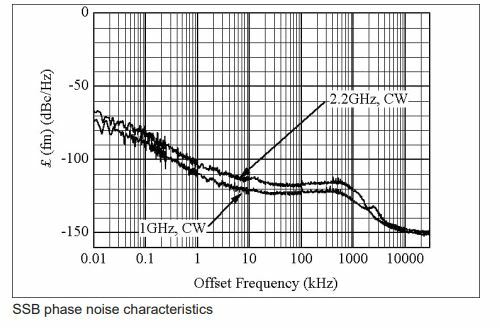 A through check of the attenuator shows that it is working in 1 dB steps – i.e., the MG3561A is only using a 1 dB for linear adjustment of power, and all the other attenuation is by the switched/mechanical attenuator. 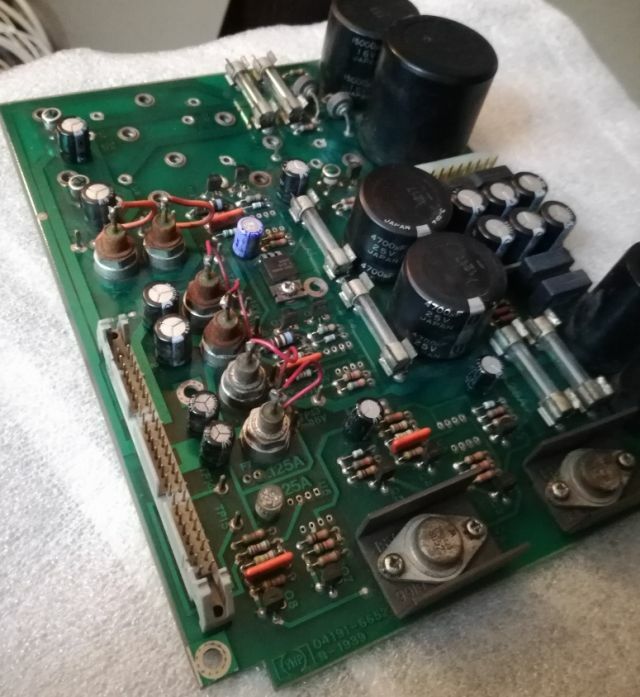 This true up to +5 dB, above 5 dB, the attenuator is set to 0 dB and the gain of the output amp is determining the power. Same below -135 dBm. Attached detail from the service manual shows the detail. 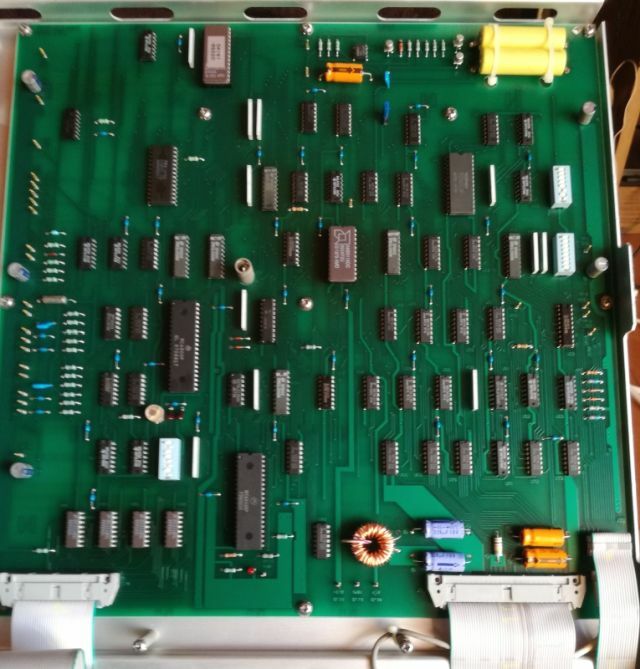 After all, I was able to confirm good working condition of the attenuator. 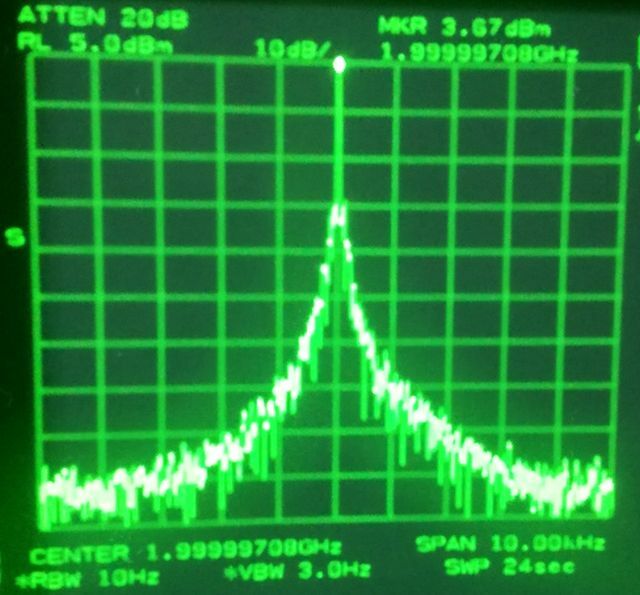 Next, some tests of the output level of the RF amp assy, which feeds the attenuator. 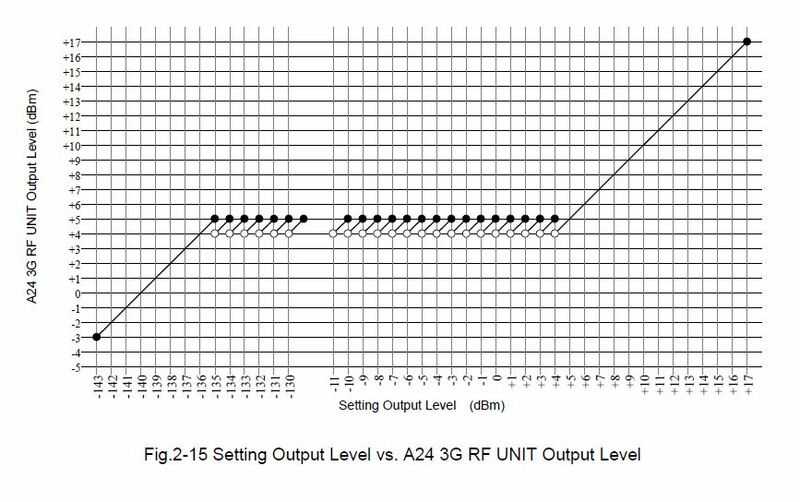 And, not surprisingly, the output power is already low before entering the attenuator. 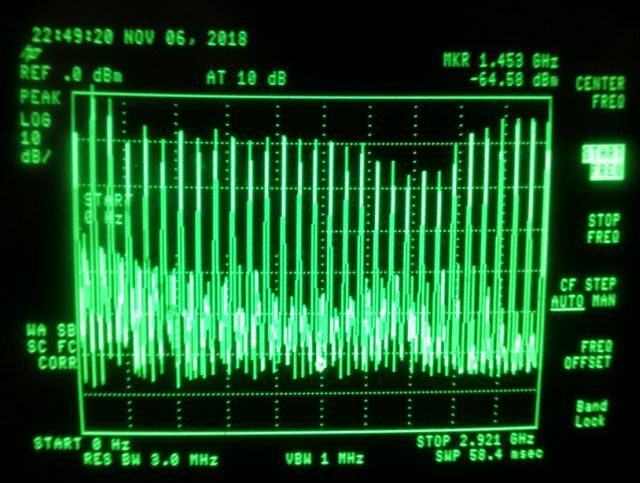 All is leveled and working as it should, and also flat regulation with frequency (! ), but too low power. 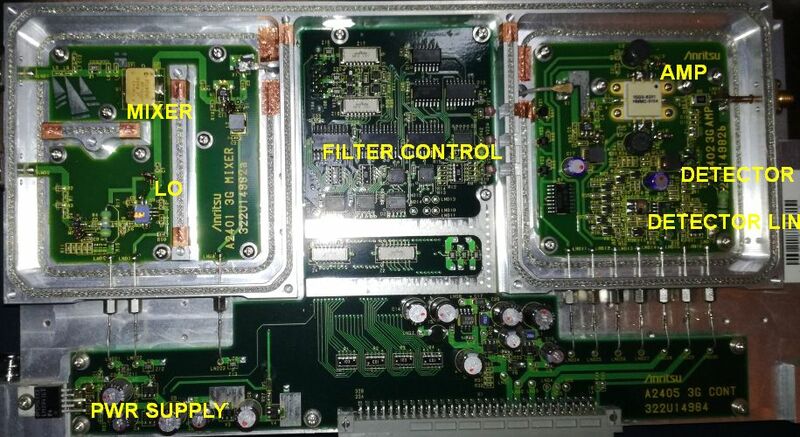 Following the service manual, there is a complicated procedure for output power adjustment. 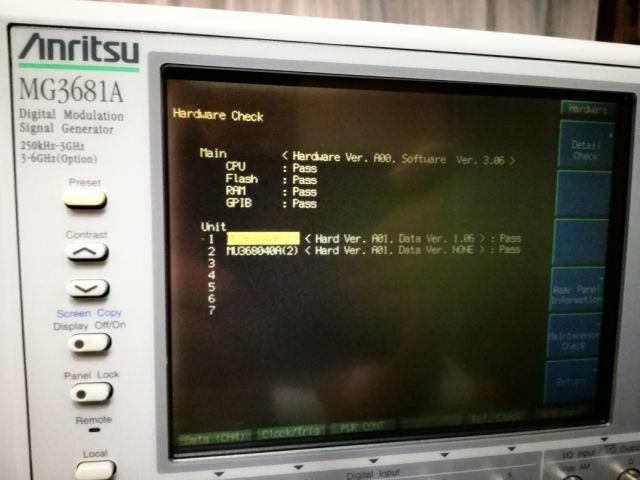 It requires some special software, and two more Advantek instruments that are hard to come buy, and actually, we don’t have any issue with flatness or response, but just an offset of the level. 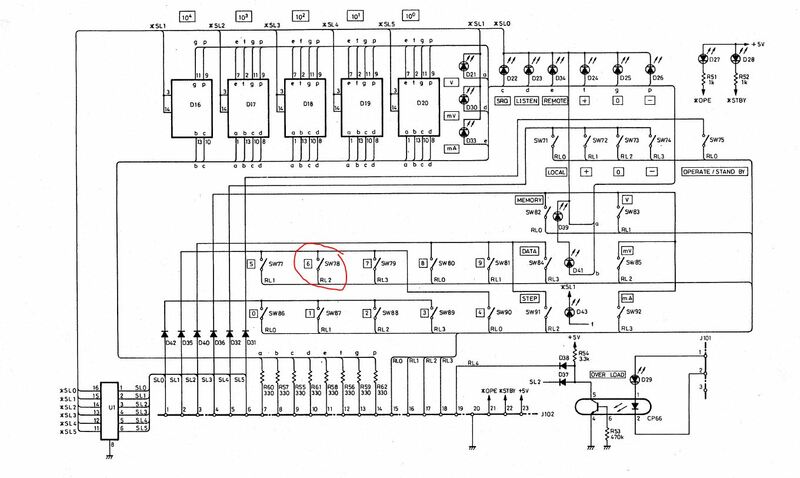 So we should be able to correct this somewhere in the analog circuit, say, in the opamp doing the ALC control, or in the DAC setting the output level. 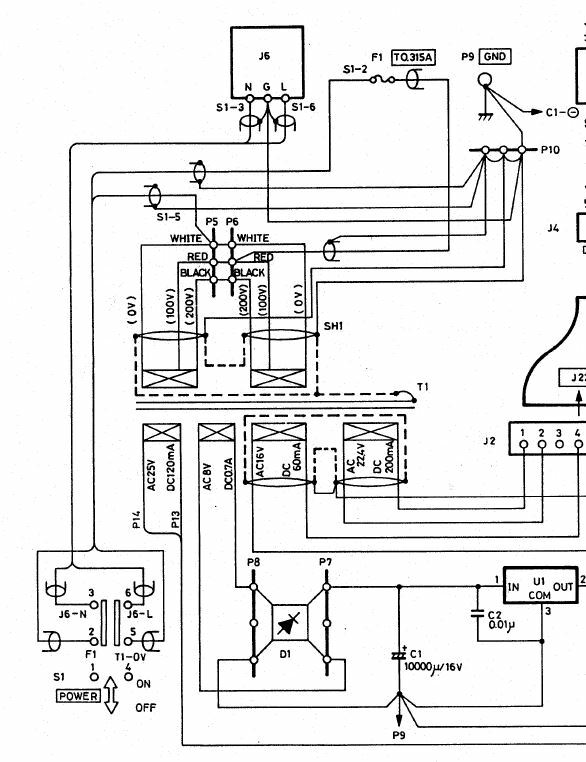 Studying the circuit a bit, with the block diagram, and some general knowledge about such analyzer. The function blocks are clear. And a quick test showed that the level detector itself is working. 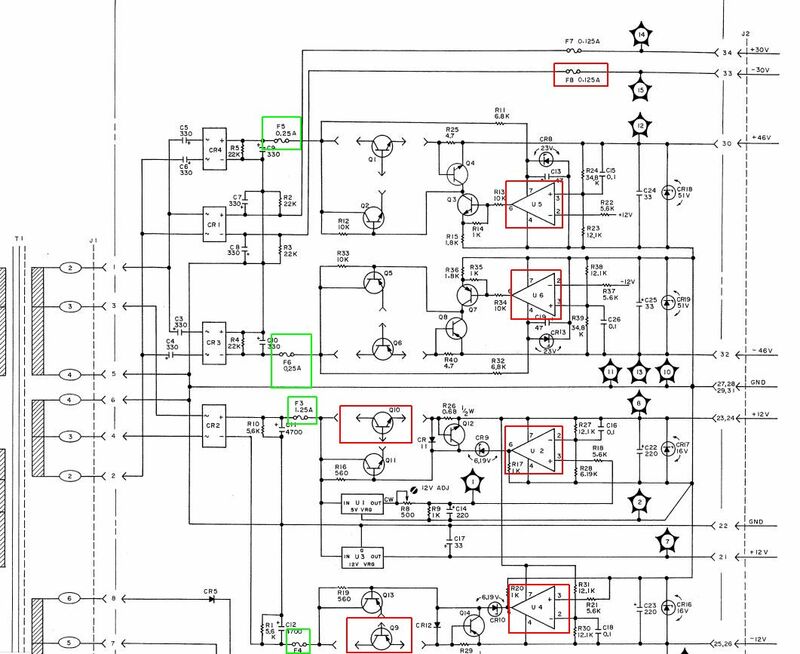 So we need to troubleshoot the level control loop and opamp. 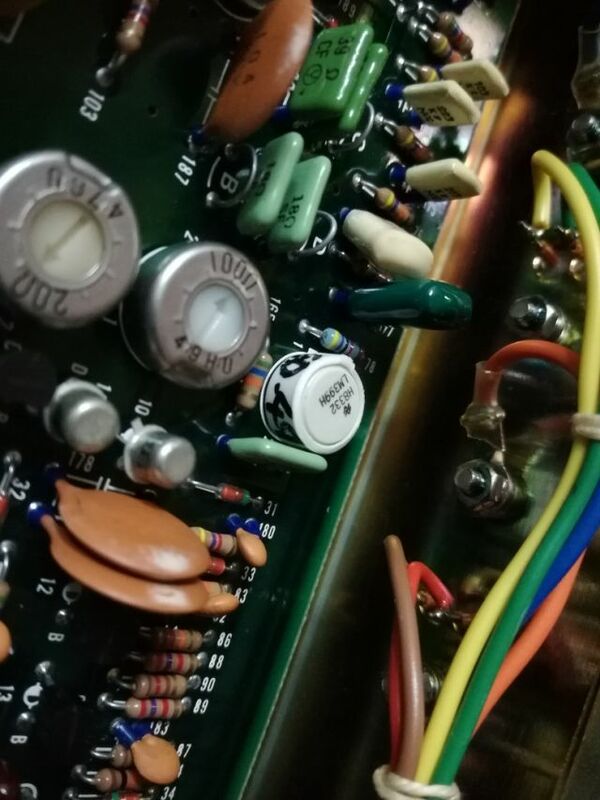 Another interesting observation – the digital control of the final amp is actually done by light beams (IR diode sending, IR receiver), to transmit digital information noise-free to the final amplifier. Note the gaps in the cover, marked in the yellow circle. 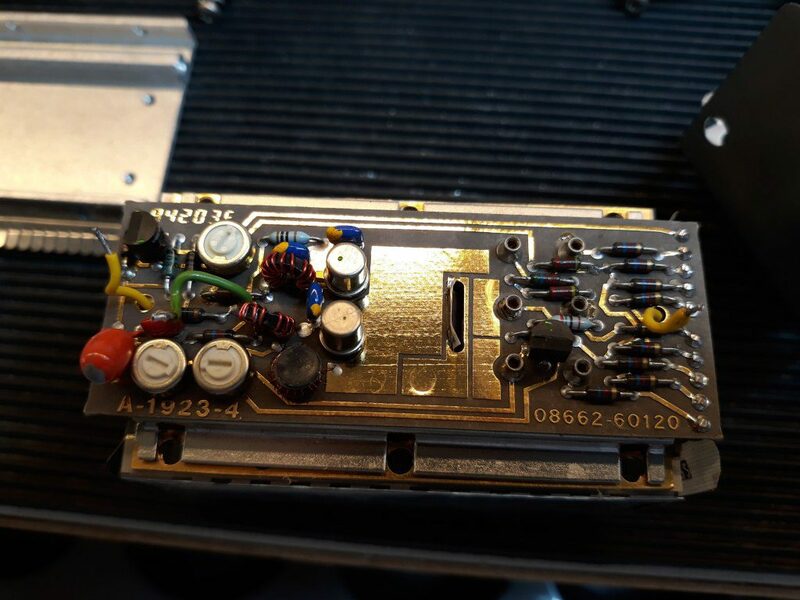 That’s where the light passes from the digital control to the amplifier section. This level control circuitry is part of the modulation assembly, which is a fairly complex assembly. But, what is this? There are several micro-size adjustment pots. Could it be that one of the relates to the ALC loop? How can we find out? 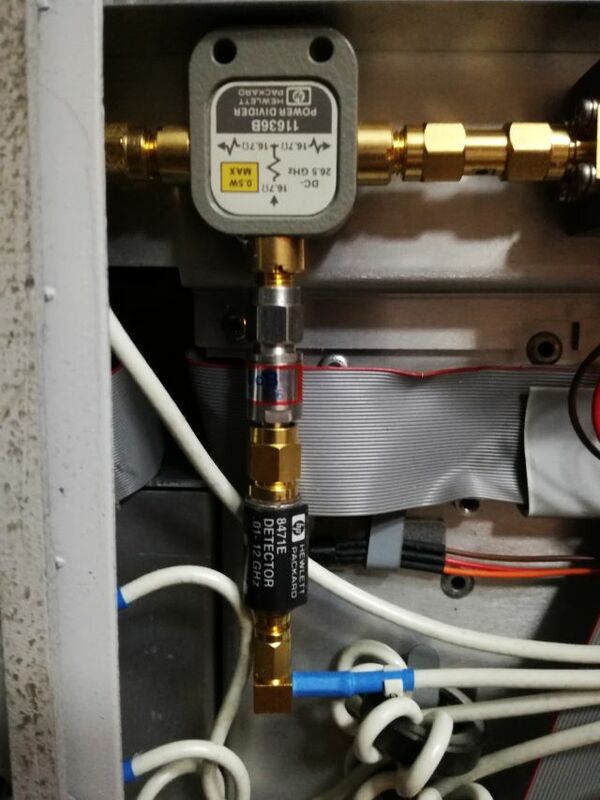 Easy enough, we monitor the output with a power meter, and turn each of the pots a bit, of course, not without clearly noting its original position. 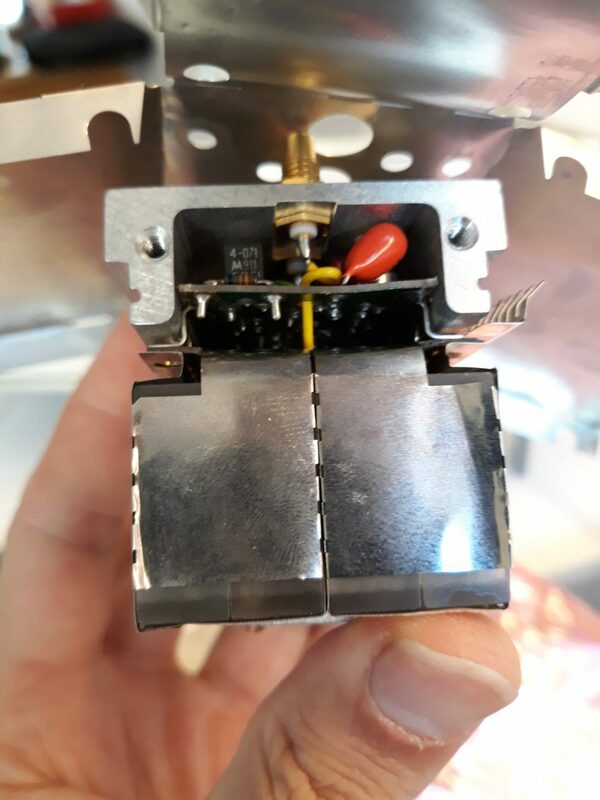 The 3rd adjustment pot – it does affect the output power! 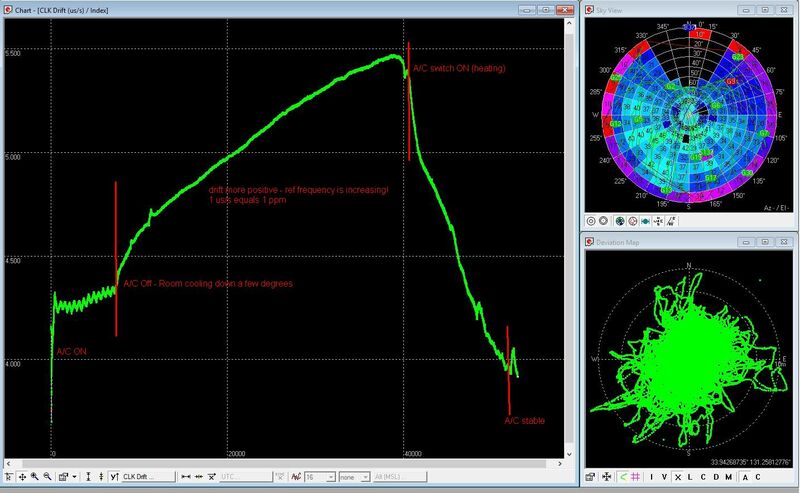 And, surprisingly, I can easily increase the power by about 6 dB. 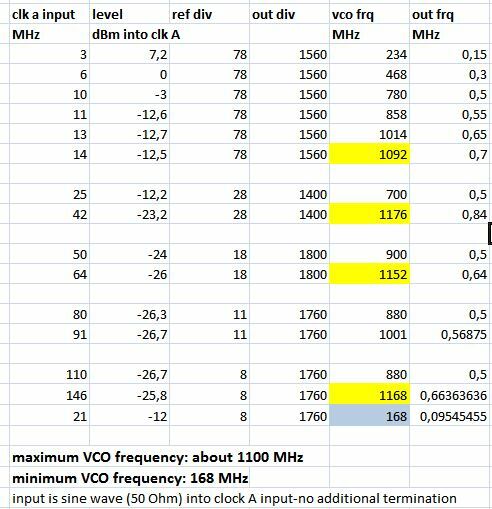 With this adjustment identified (I could not find any reference in the service manual to these adjustments), I rechecked and readjusted it output power at a range of frequencies from 1 MHz, 10 MHz up to 3 GHz, and flatness is in fact very good! 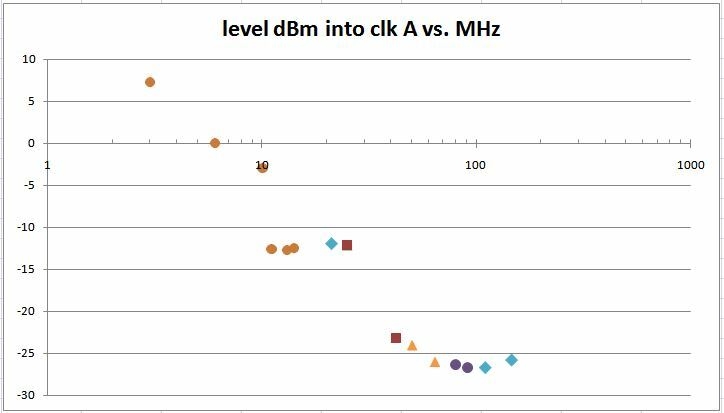 Also, I get the expected performance now when increasing the output power past about +14 dBm – an uncal-unleveled message is coming up, indicating that the maximum output power has been reached (the MG3681A can provide about 14-15 dBm leveled power over the full range). 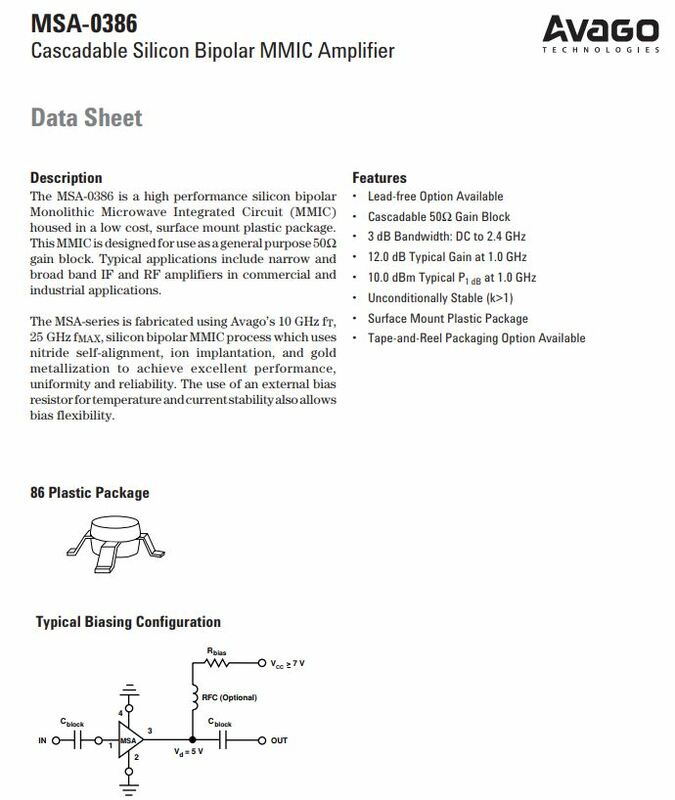 A good amount of logic in programmable devices (firmware of MG3681A can be updated, if you have any such firmware, please share with we!). 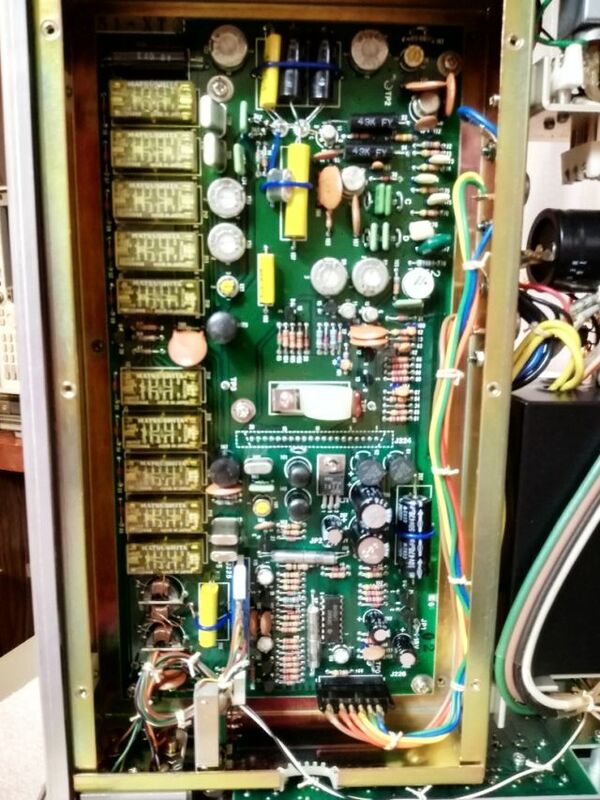 Another view of the inside of the instrument – it is what I call the Japanese test equipment design, a lot of empty space, all well arranged, and many different types of assemblies and hardware with great attention to detail and sophistication, and some manual corrections with superfine wire. 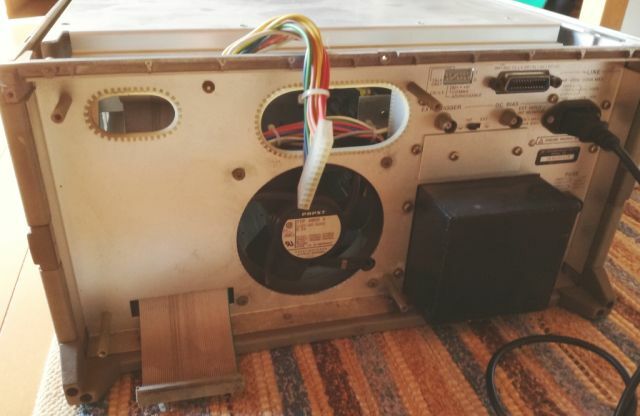 Because of such design, it also needs two fans – one for the power supply, and one for the main unit. 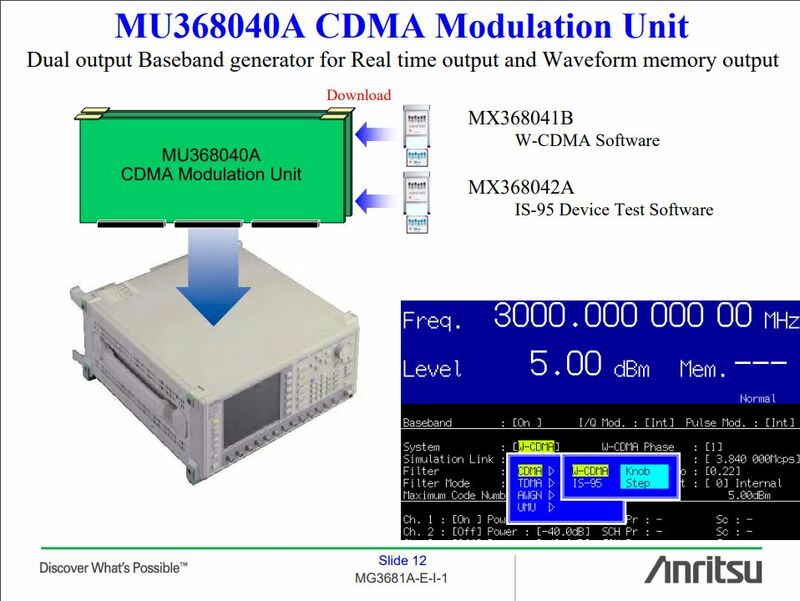 The CDMA-W functionality. 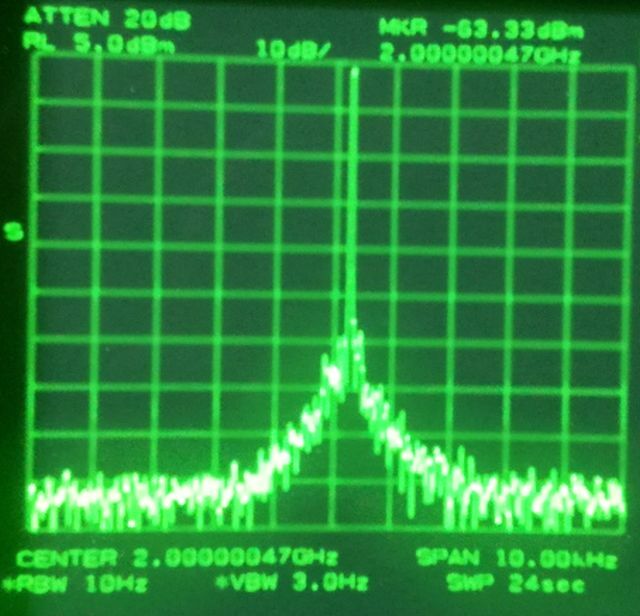 Fully working at least as much as I can tell from spectral analysis of the digitally modulated signal. 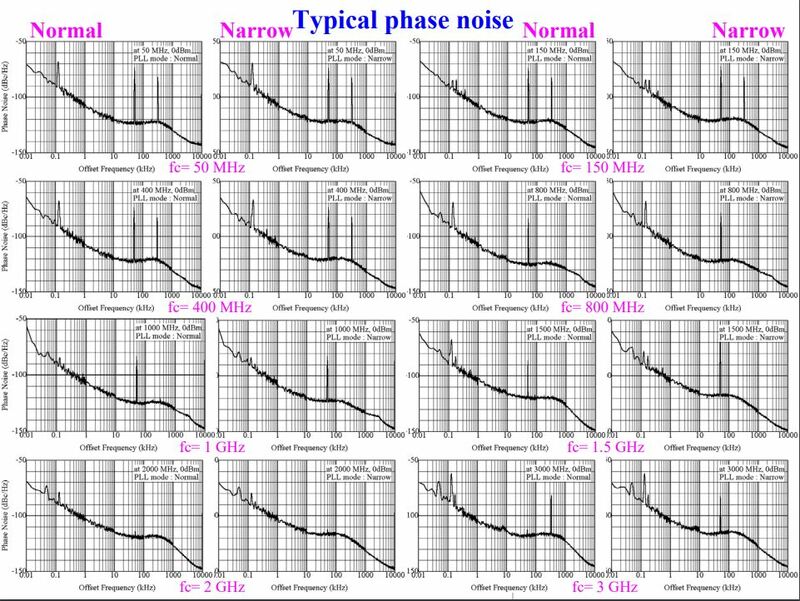 Some study of the phase noise performance. The MG3681 is not too bad, it has fairly low SSB noise, even close to the carrier. 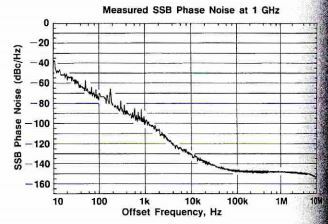 For comparison, the phase noise of a 8642B, which is a good HP generator, not the best for close in phase noise, but it is a low noise and heavy and sophisticated machine, even without any digital modulation. 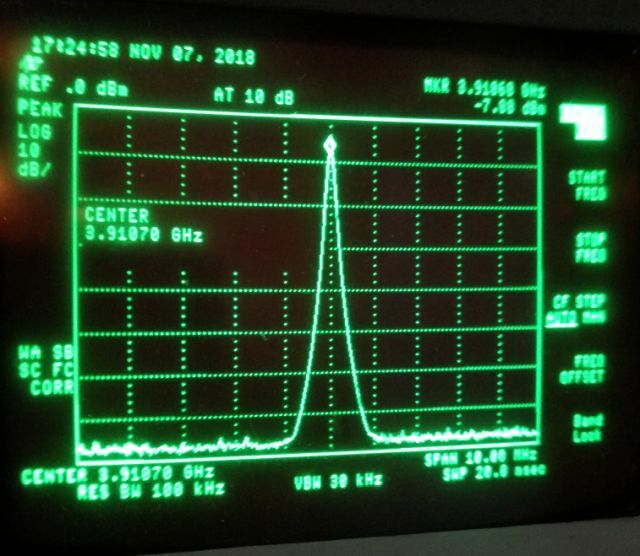 No sophisticated phase noise test gear set up here, but let’s study it on a 8561B analyzer, at 2 GHz frequency. 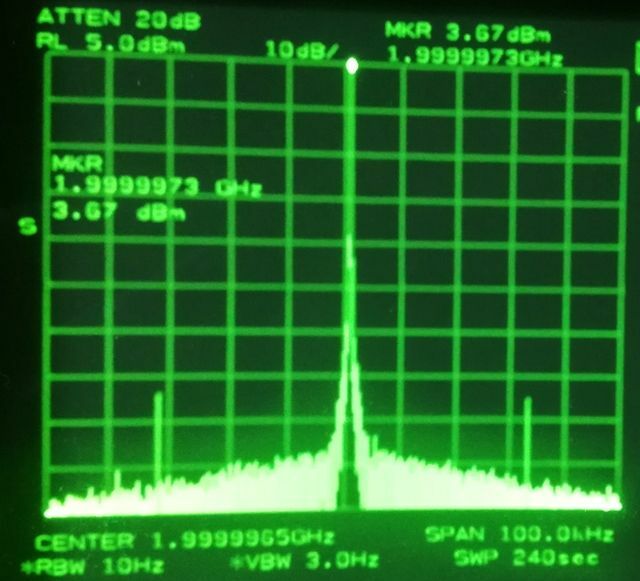 At 100 kHz span, the noise of the analyzer dominates, and both the 8642B and MG3681A show very much the same levels. 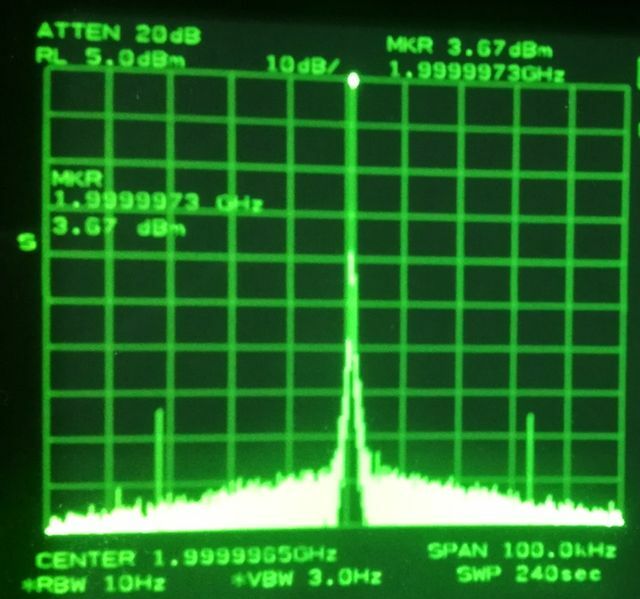 Close in, at 10 kHz, the MG3681A appears superior, maybe, by about 10 dB. Not bad! 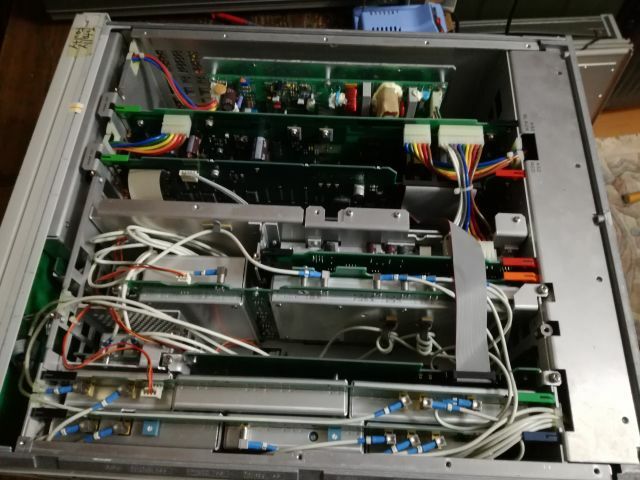 With all the functions established again – some clean up: removed all the dust, checked all the connectors, and put the thing back together. Now, all is hidden again under several sheets of metals, and all the many screws (not only many pieces, but also many kinds) back in. Let’s hope we don’t need to open it soon again! 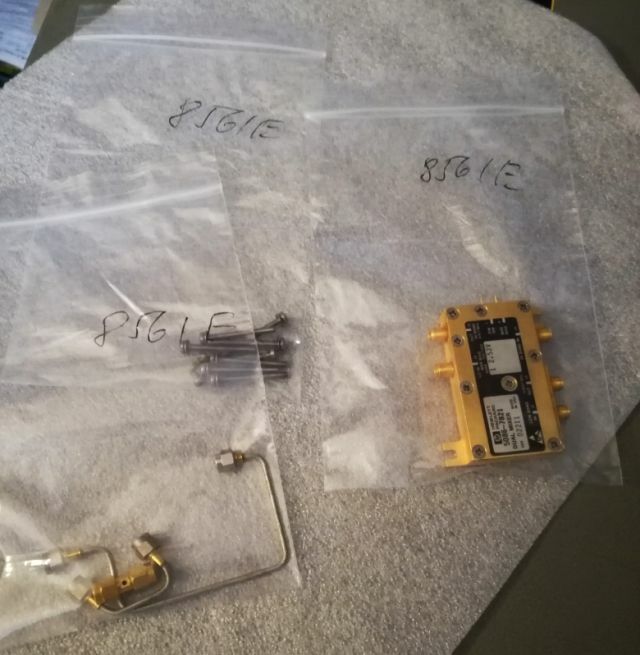 With the Si5351A mastered, time for some tests with the actual application, the GPS receiver (and later GPSDO system). 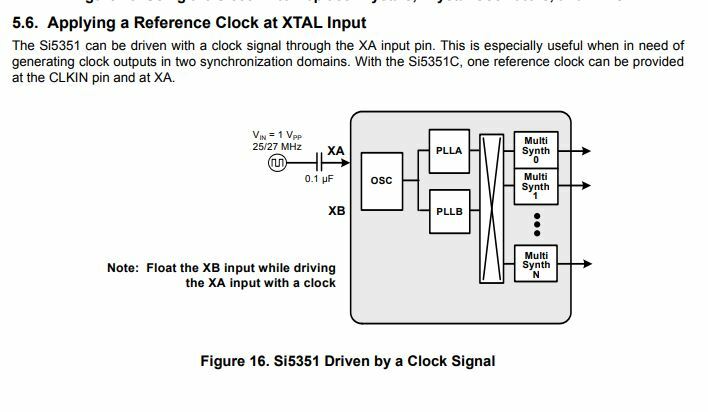 (1) Using the Si5351A clock generator with a standard, not specifically selected or particularly stable crystal. 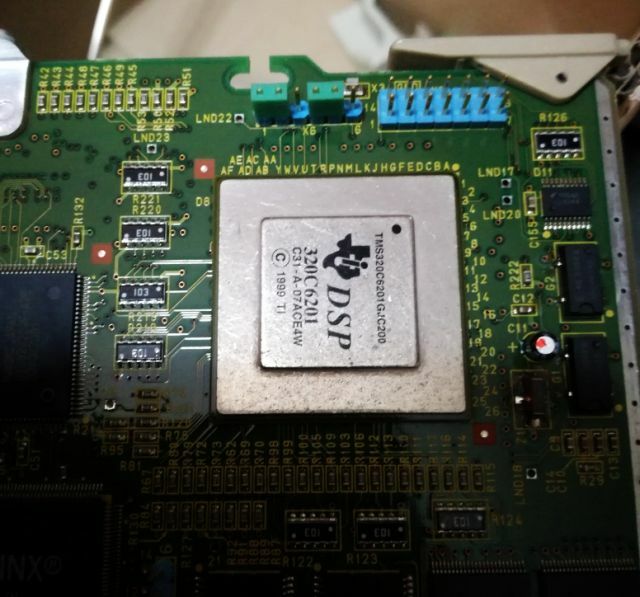 Presumably, an AT cut crystal, running at 25 MHz. 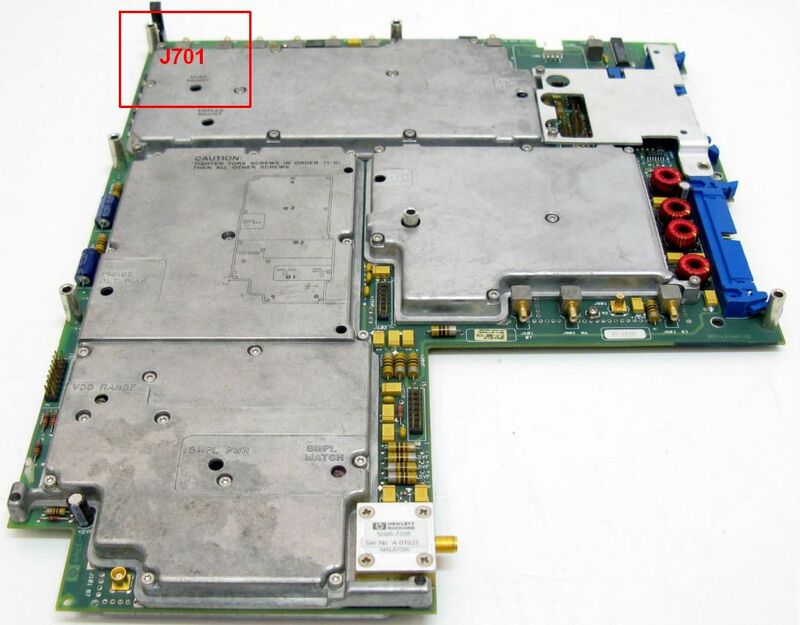 (2) With the Si5351A driven by a OCXO (HP 10811A, part of a 8662A unit – will be later replaced by a stand-alone unit using a HP 10811A with power supply and distribution amplifier, but essentially, to the same effect). 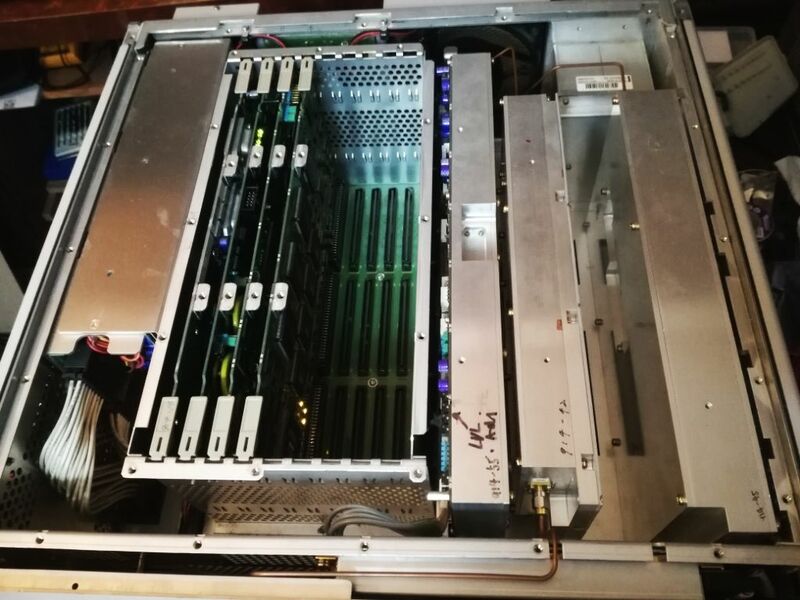 The first test, we need to set the registers of the Si5351A (check the Silicon Labs AN 618 Application Note – check it in a quiet hour, because it has a lot of heavy content…). 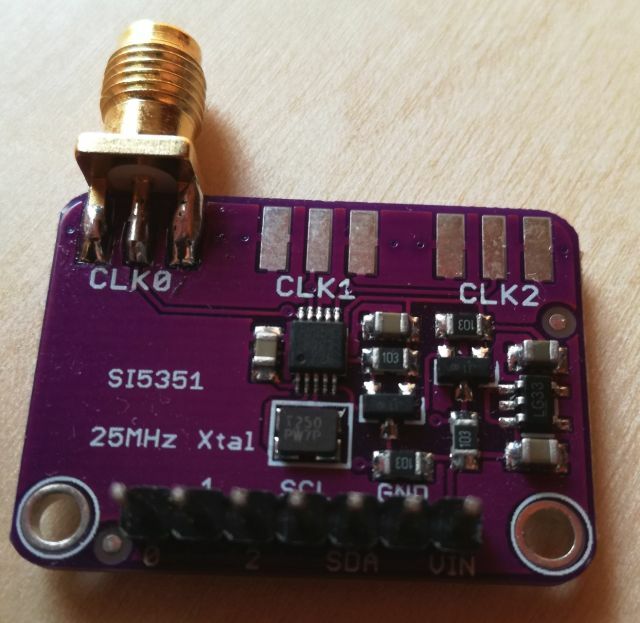 25 MHz clock input, 26 MHz OSC0 output – can be achieved by running the VCO at 650 MHz, and integer-only dividers. 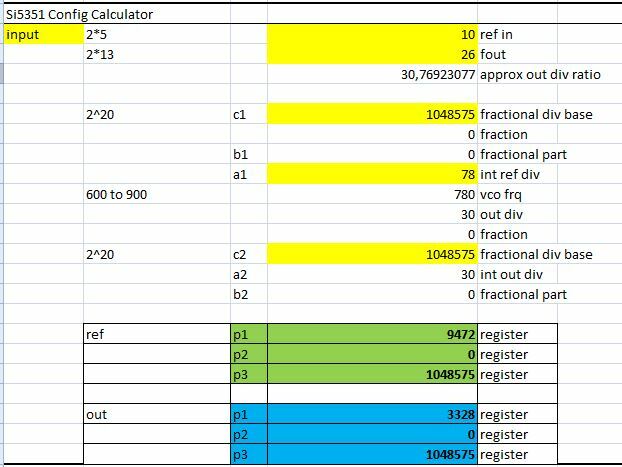 For the calculation, I use a self-made Excel sheet, which allows me to play around with the numbers to figure out the best combination of dividers and VCO frequency. 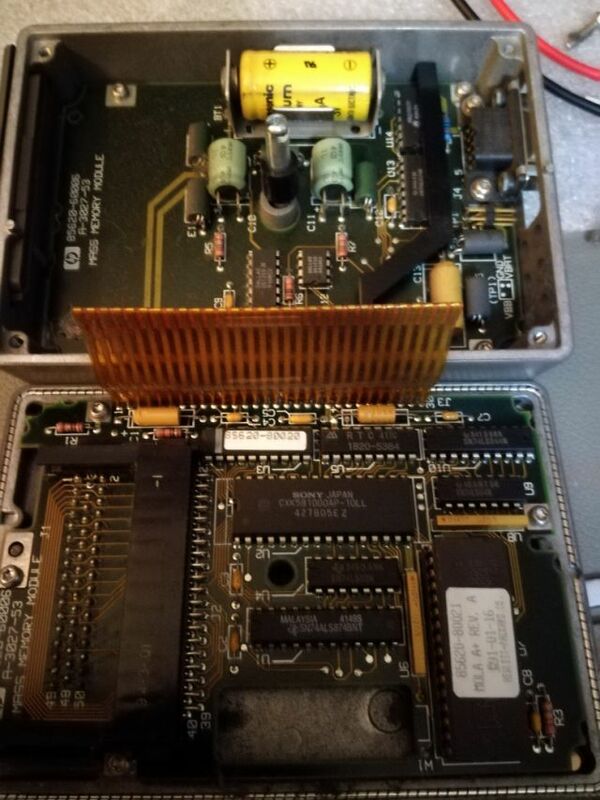 That’s the Xtal used – it came with the board, and I couldn’t find any data on it. Appears to be an AT cut crystal. Starting from room temperature, frequency, will go down with increasing temperature, and up with colder temperatures. Such temperature variation is easily introduced here in Japan. First, keeping the room at 22 degC by the aircon (A/C) unit, then switching it off overnight (cooling the room by a few degrees, maybe down to 17 degC), then, next morning, heating up again to 22 degC (and a bit more as we had a sunny day). The detail below also shows the small thermal mass of the Si5351A, free-hanging in air. Better to enclose it or to add some thermal mass later, to avoid thermal-gradient introduced noise or instability. 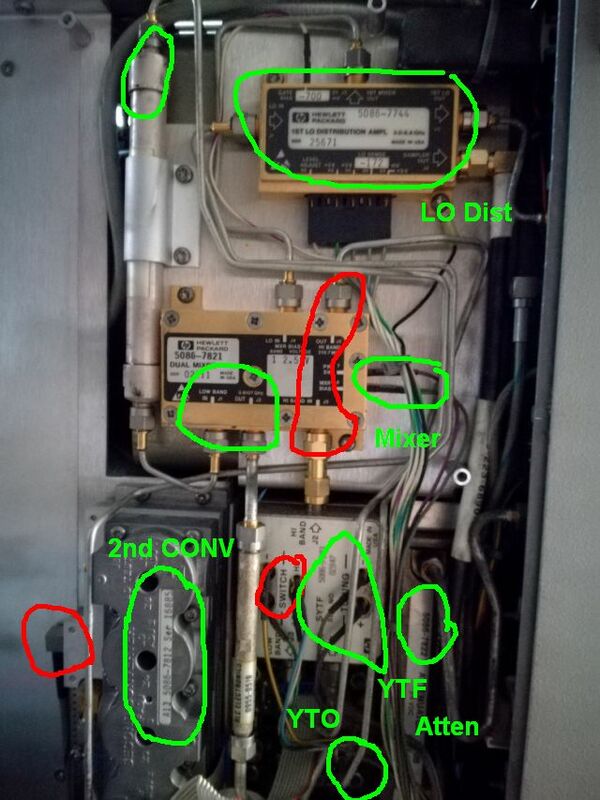 You can clearly see the on-off cycles of the A/C unit regulating the room temperature. 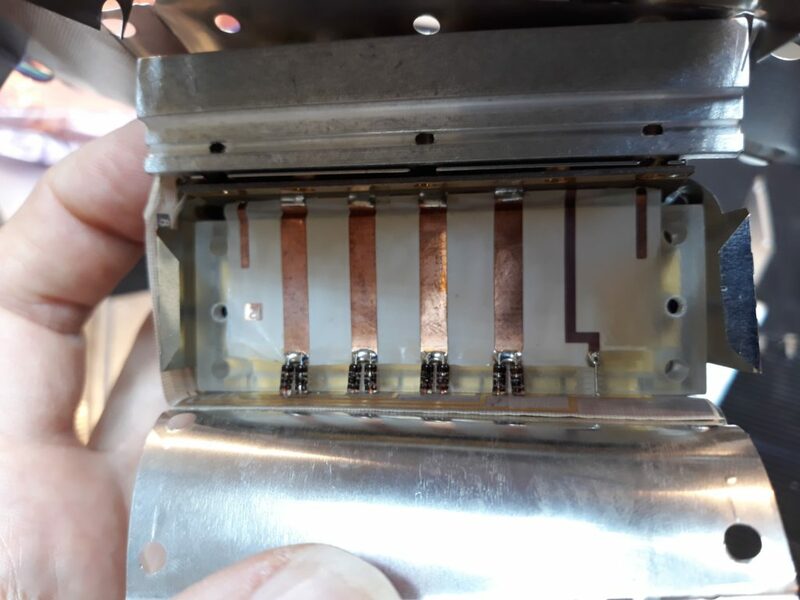 After all this study, we find out that we can use the GPS and Xtal as a quarz thermometer (such thermometers really exist!)! 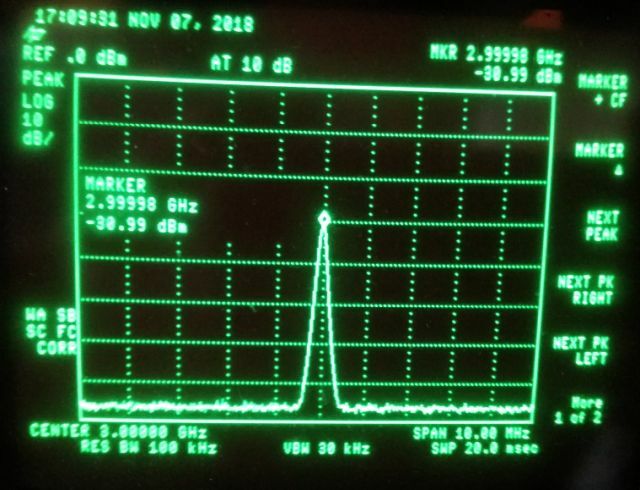 Test 2, now running with a 10 MHz reference clock, and still 26 MHz output to the u-blox M7 (in all cases, the u-Blox has been modified by removing the TCXO, and feeding the clock signal directly to the GPS chip). 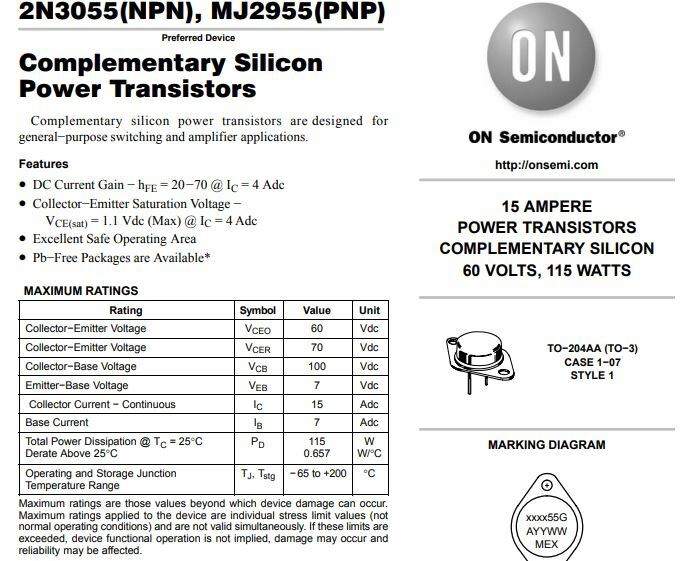 Sure I known that I am running the Si5351A outside of the specified range – but after all the research, Si5351A Spec, Myth and Truth, I believe this is OK. The test setup – note the dotted additions – this will be the later phase locked circuit. 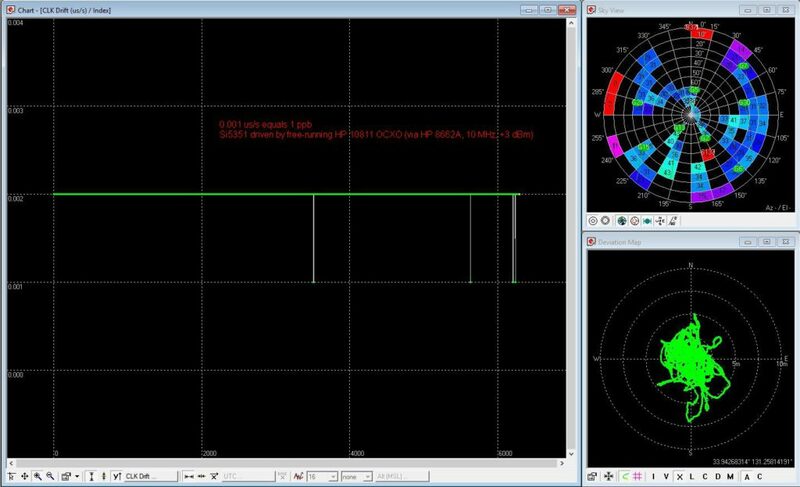 The register settings – running the Si5351A VCO at 780 MHz allows the use of integer-only dividers. 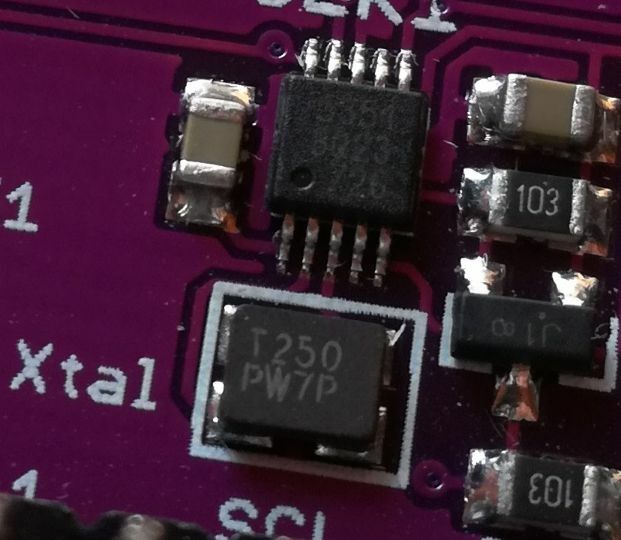 Capacitance set to 4 pF (the lowest value possible for the Si5351A, but it has little effect on sensitivity, 10 pF default setting works as well, maybe 1 dB decreased sensitivity, but we are anyway feeding more then enough power to the Xtal A input of the Si5351A). 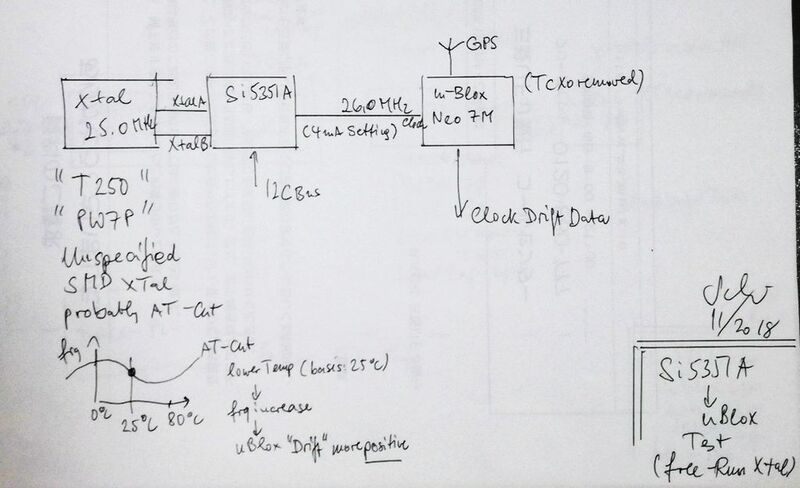 The GPS clock drift data – not very exiting – no drift at all, less than 1 ppb over a few hours. 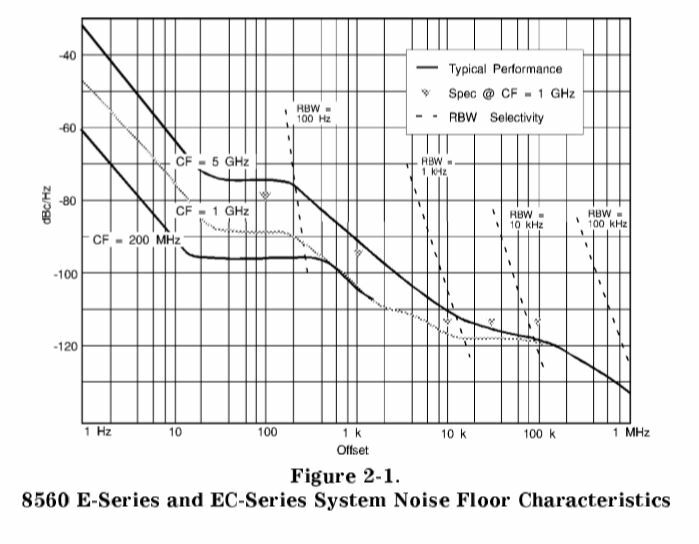 There is a slight frequency offset, because the electronic frequency control (EFC) of the 10811A OCXO set to 0 Volt, rather to the proper value for exactly 10 MHz, only for convenience and to avoid any artifacts from EFC DAC noise or drift. The position accuracy also seems better with the stable oscillator, but may need to check this again after acquiring data for a full day or so. All in all, more than a proof of concept. 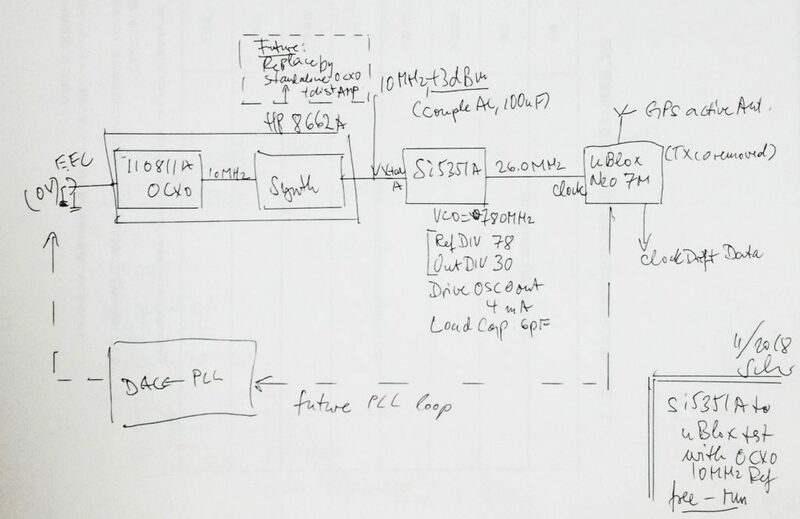 Next steps include setting up a stand-alone OCXO (I have a couple of spare 10811A OCXOs around), a distribution amplifier (nothing special, planning to use some 74HC14 with small signal transformers for isolation), and getting the PLL code into a microcontroller. 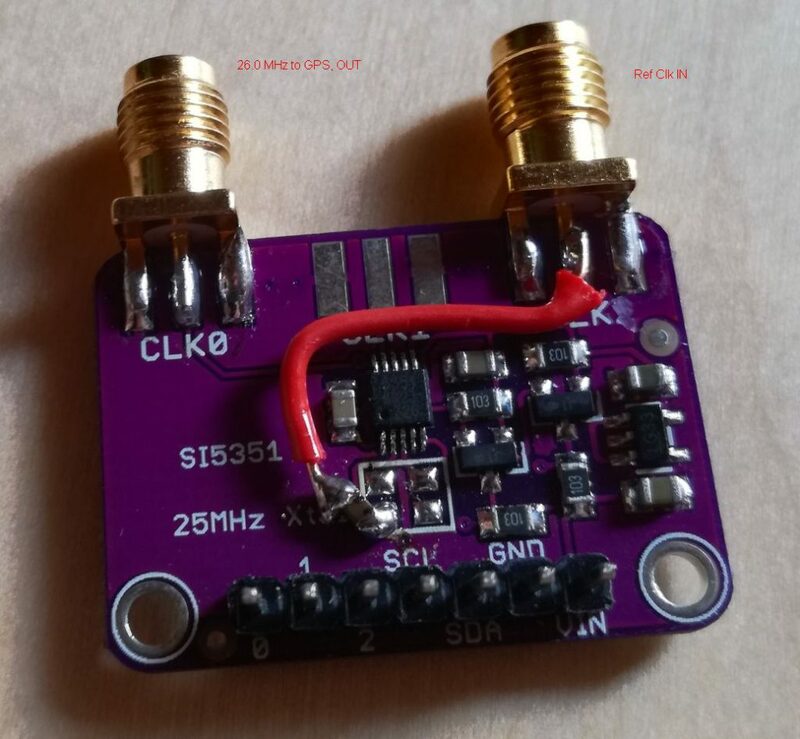 For the DAC, I will use a fairly basic model, and provide a low pass filter at the output (much faster than the digitally-generated long time constant low pass of the PLL loop, but still slow compared to common standards) to reduce noise. So far, the bill of material is very low, just a few dollars, including the GPS receiver. 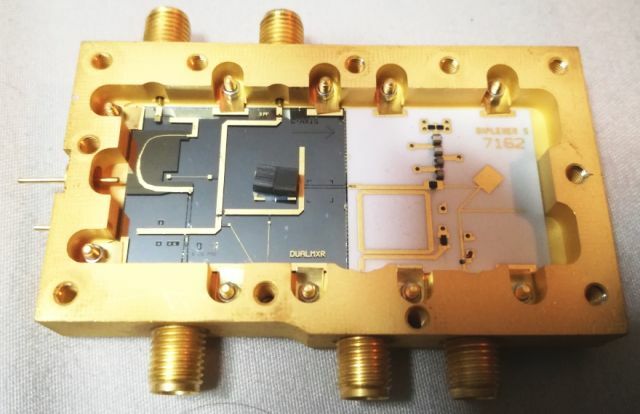 My goal is to stay below USD 10 total, excluding the OCXO, to achieve better than 10-9 stability, and an output with no jitter or other issues. I found a great deal on a “totally faulty” 4352B, well, it is a bit a cat in a sack, as we say in Germany, you never know what you get. It shipped from Manila, even better! List price, I think it was close to USD 50k! It’s a clean unit, except for about 100 stickers and seals! All heavily shielded, many kinds of screws and metal plates to keep to good waves in, and the bad waves out. 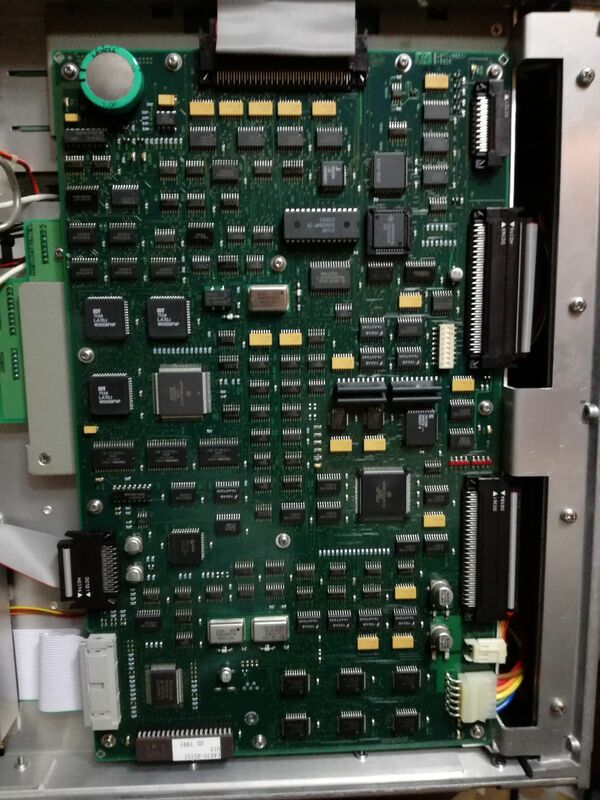 The brain of the machine – quite sophisticated – Japanese engineering (this unit has been manufactured by HP Japan!). 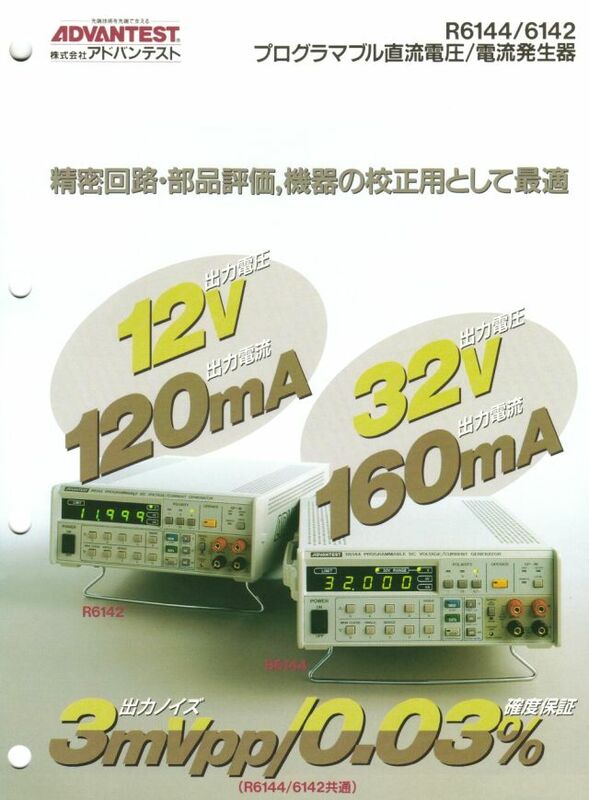 After some study and test, it is clear, it is dead because there just isn’t any power. 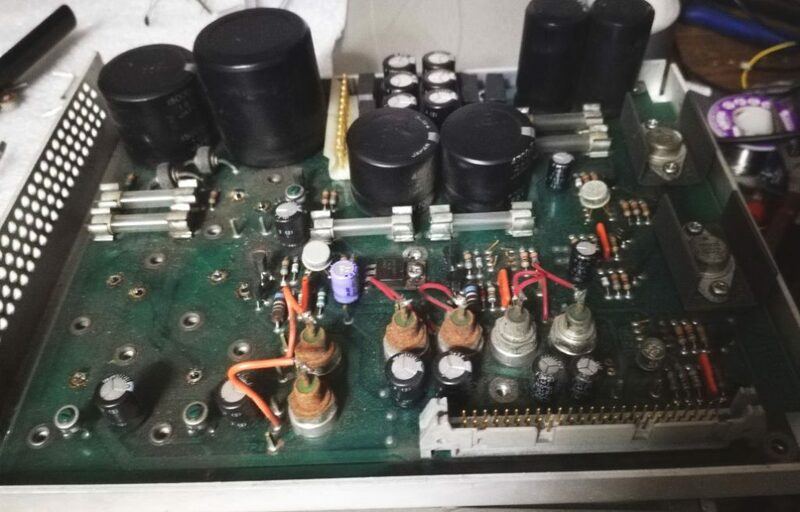 The power supply is a two-stage supply, first stage, a switchmode universal voltage to 24 Volt (190 Watt) supply, bz maker Artesyn, then a really top quality 2nd stage, made by Agilent. 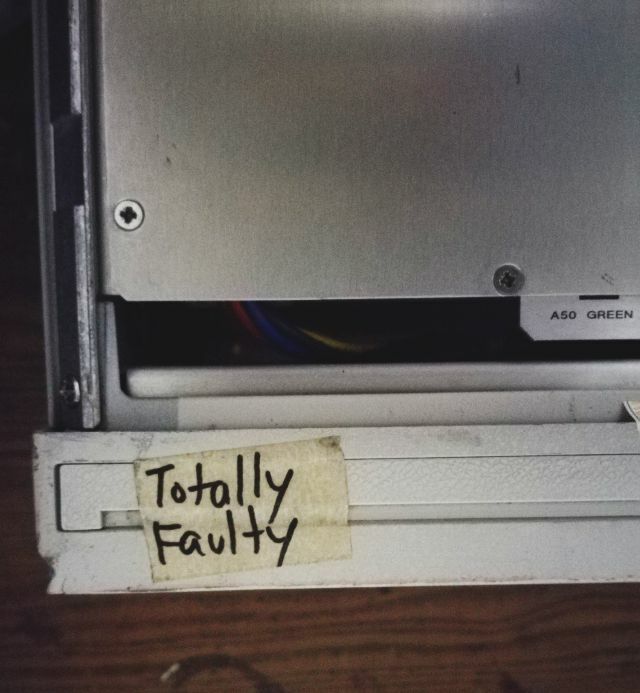 And guess what, the 24 Volt supply is faultly! 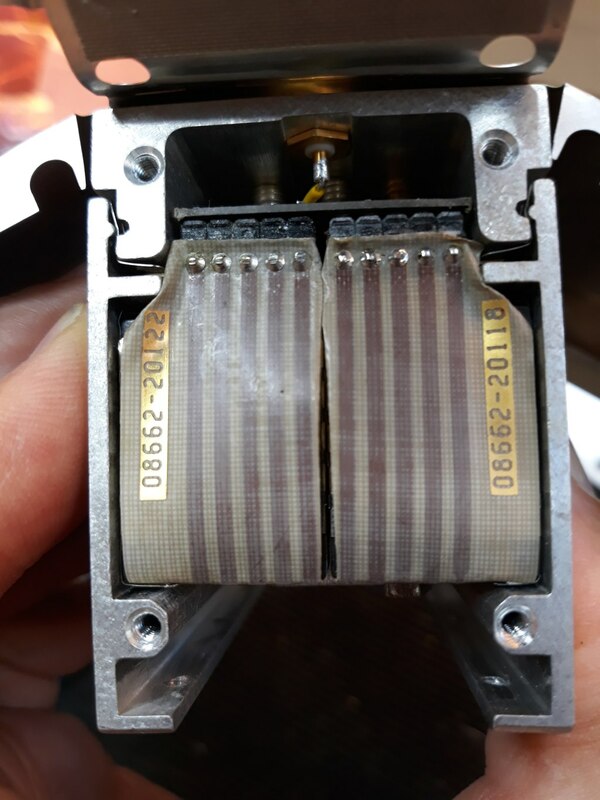 This supply uses power factor correction, and two IRFBE30 MOSFETs to drive the transformer – one of them is shorted shot. 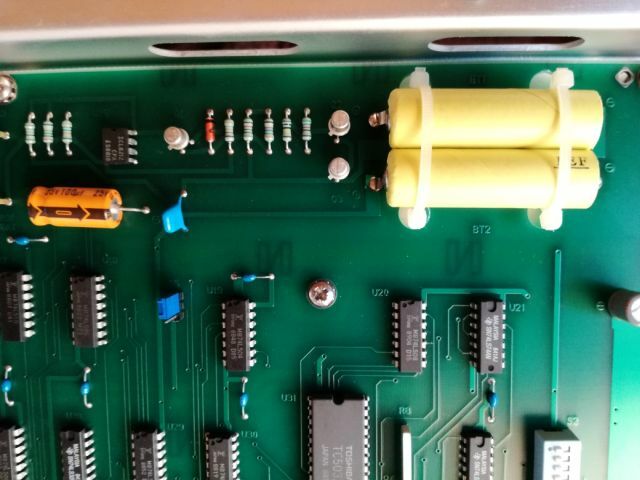 Otherwise, no damage to be found on the board so far, except the thermal fuse, which must have cut out immediately (even the primary fuse is OK – so there is hope that this will be an easy repair of the 24 V supply). 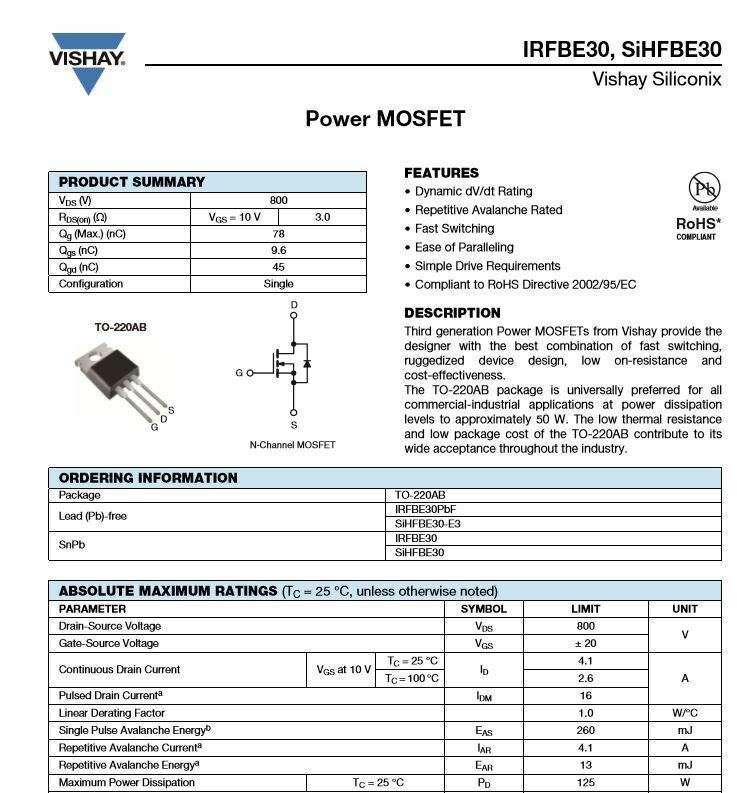 Ordered some spare thermal fuses and MOSFETs, quite common IRFBE30 type – low cost. 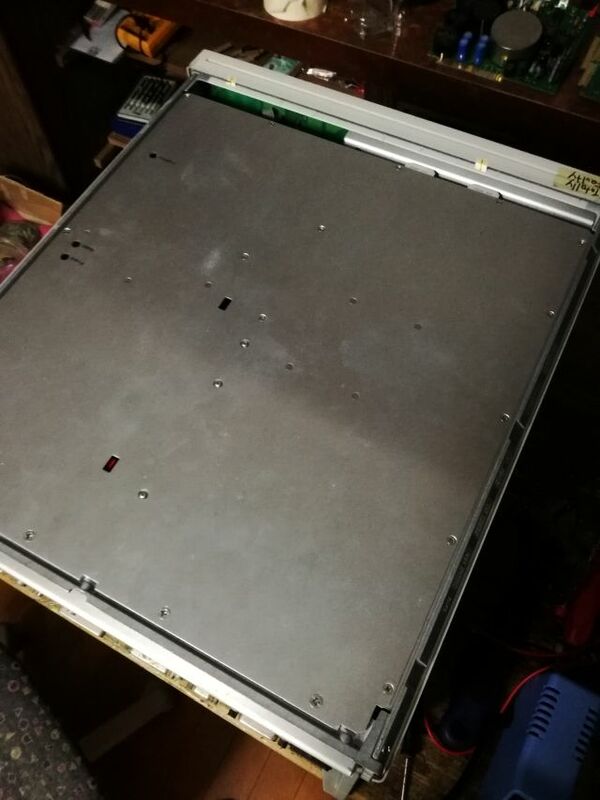 Let’s see if this will let us get the power back, if not, worst case, we can always install a new 24 V 200 W supply – there is enough space in the case. 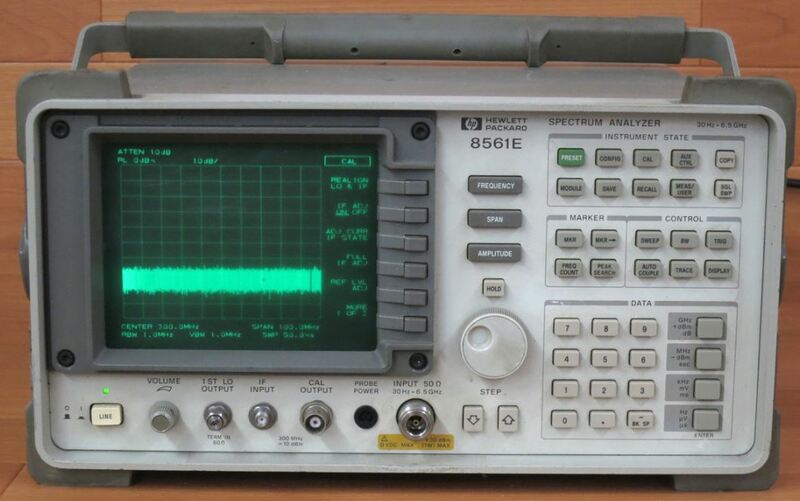 In any case, these VCO analyzers are a great deal – there is a 26.5 GHz (!! APC 3.5 !!) 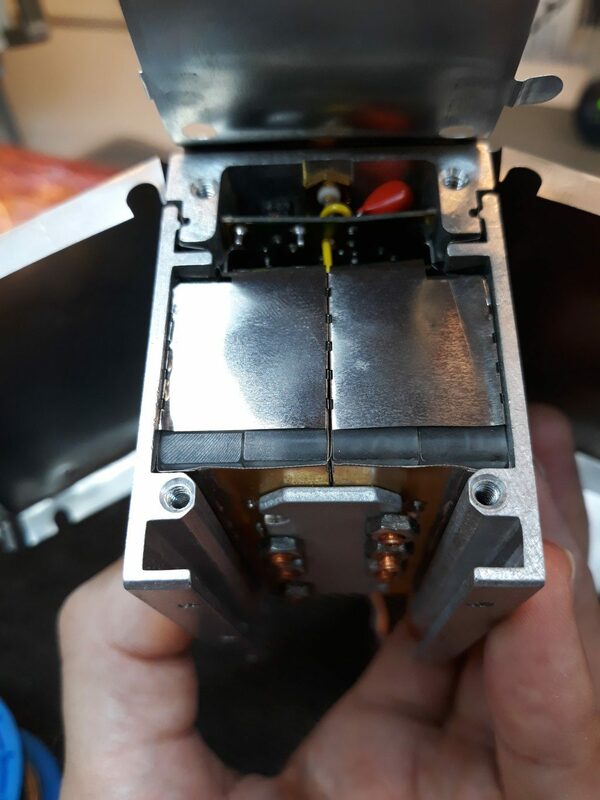 power splitter inside, value, still available today, EUR 1350, and a 13 GHz detector, value, 450 EUR. But let’s keep fingers crossed that this won’t become a parts unit anytime soon. 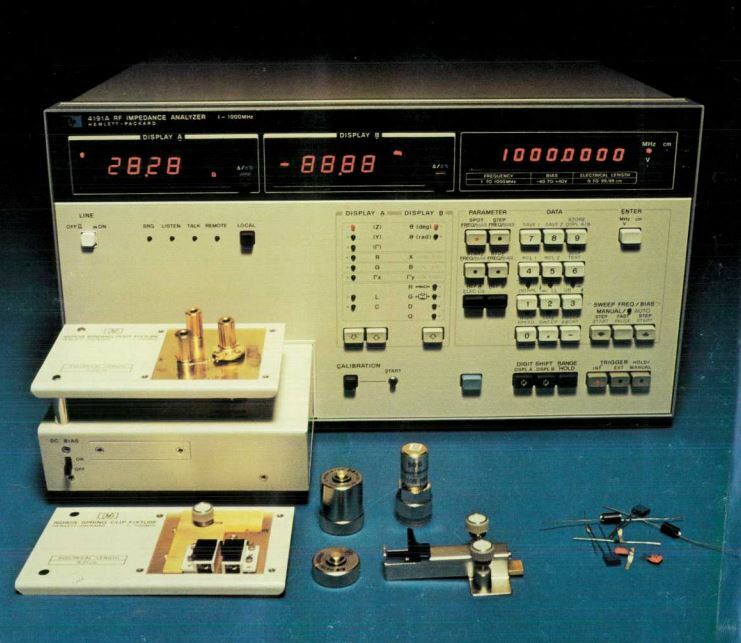 This is certainly one of the electronic antiques and marvels, which had the most hidden and non-spectacular impact on mankind and development of mobile communications in the 80s and 90s – the VCO of the 8662A/8663A, the defacto standard for low close-in phase noise signal generators. 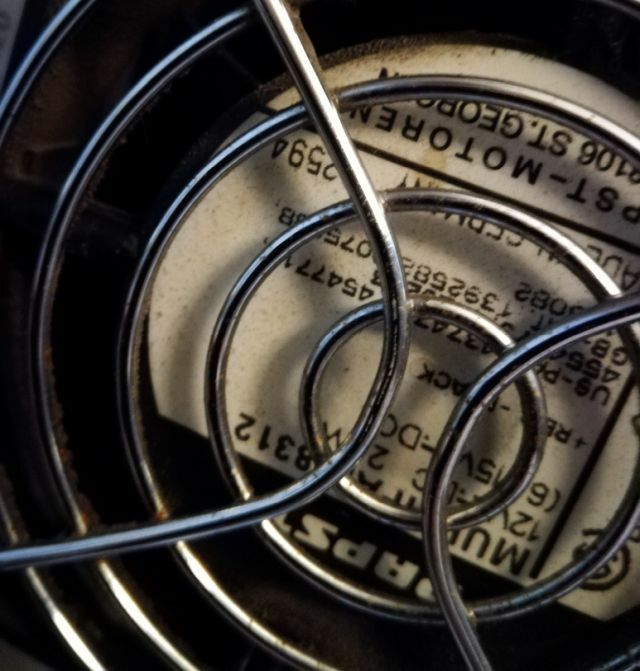 The concept, it is a switch reactance oscillator, i.e., the inductances will be switched, to cover the 320 to 640 MHz range, rather than doing this all by varactor diode tuning. 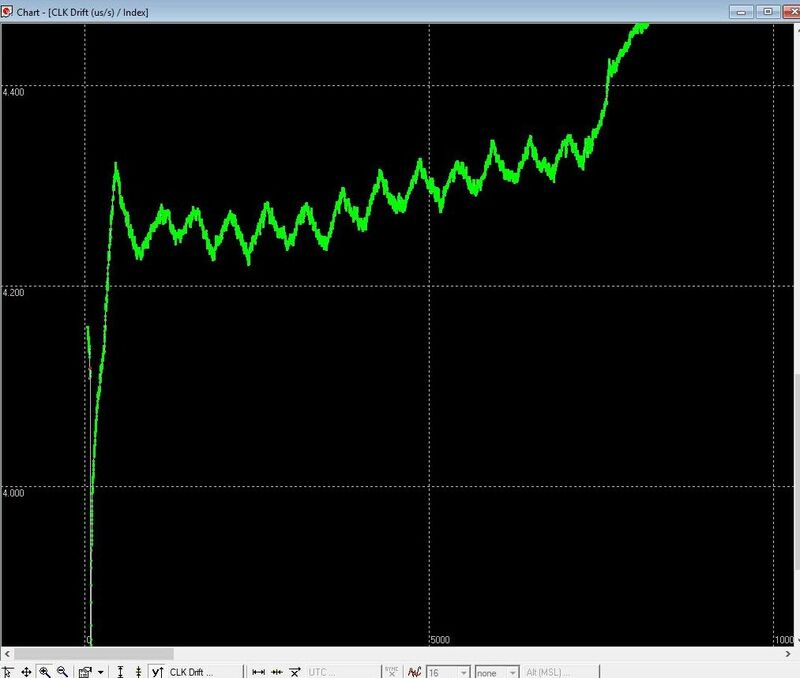 For low phase noise, you need an oscillator with high Q – this is achieved by strongly biasing the varactor diode over the full tuning range, and by low resistance PIN diodes (two in parallel, see below! 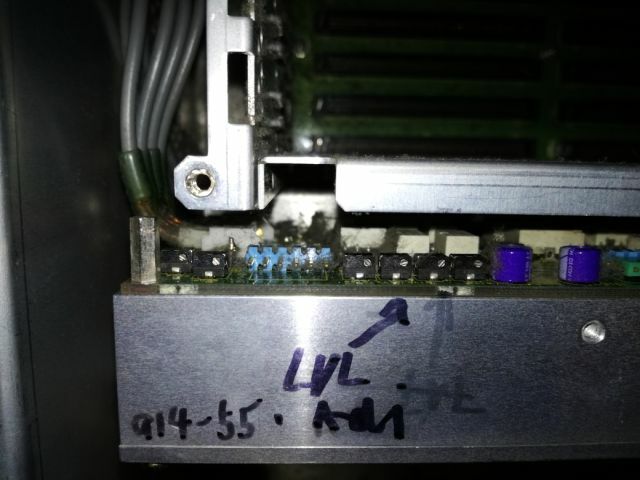 ), that switch the thin-film inductances embedded between lexane disks. 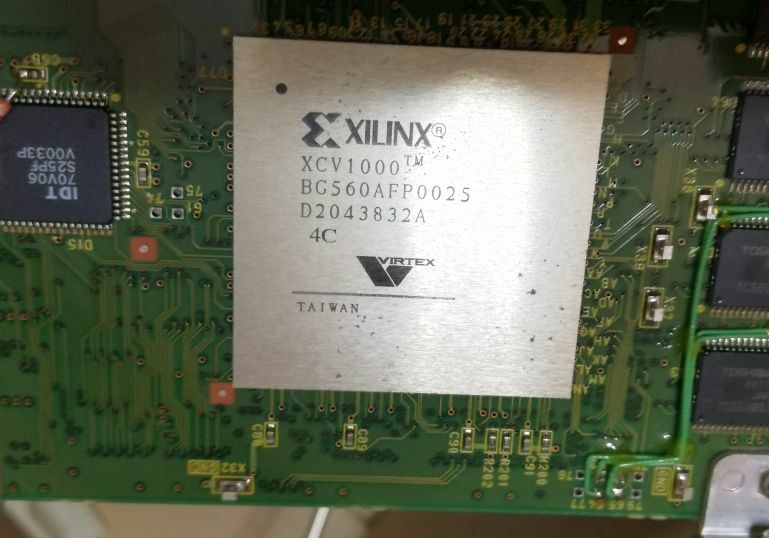 Note the small indent on the golden patch on the PCB? 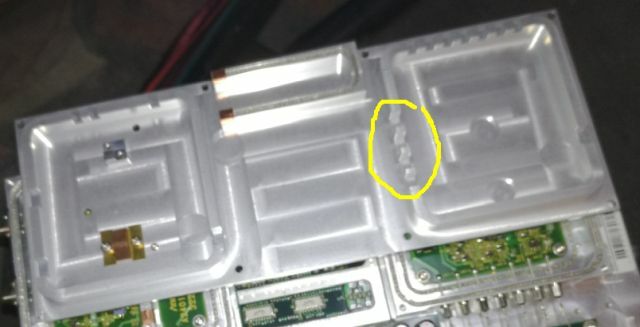 This is where the copper bolt reaches in to adjust the frequency offset. All this is housed in extruded aluminum, end a layer of special steel which absorbs magnetic fields. 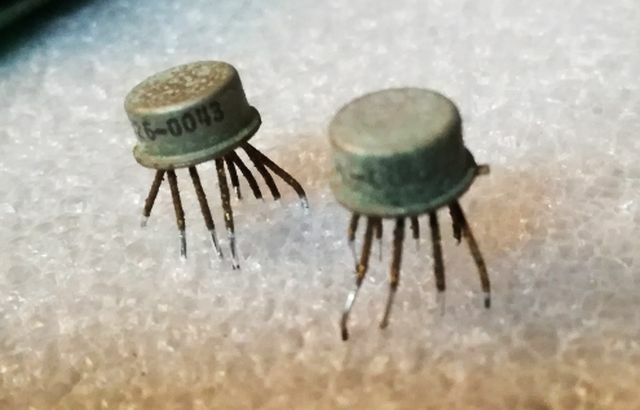 So far, I never had the chance to look inside of these – but a kind reader this block, Martin, shared this picture and I put it up here for those interested. 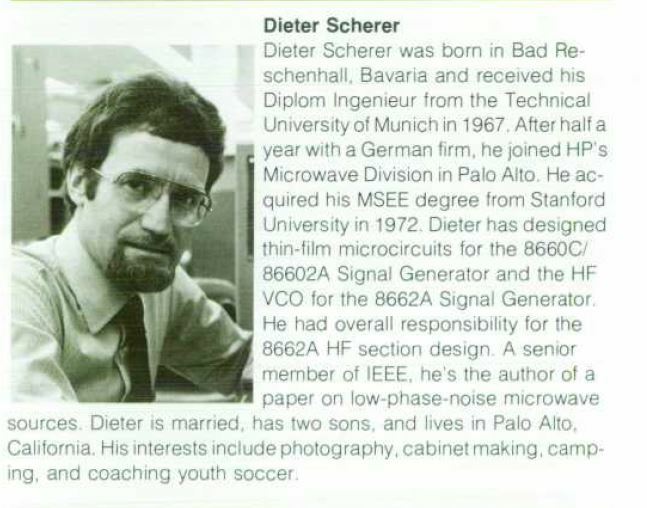 The designer of this marvelous and magic device, his name, Dieter Scherer, a German fellow of HP, unfortunately, I have never met him and don’t know if he is still alive. Sure he left behind great achievement and a legacy of high frequency engineering.